Florence La Badie leaves Biograph for Thanhouser and stardom. Florence La Badie is Marie, the homeless girl who loves devoutly the sculptor who has befriended her — but he cares only for another, a girl with a heart as cold as marble. The Marble Heart (Thanhouser, 1913). “MISS LA BADIE MAKES SOME JUMP. “Florence La Badie, ‘the actress unafraid,’ performed last week the most difficult scene, actual risk of life considered, thus far attempted in a motion picture play. The scene is one of the thrillers in ‘The Million Dollar Mystery,’ Thanhouser’s big serial. Miss La Badie escaped from a hydroplane, going at the rate of forty miles an hour and was then picked out of the water by James Cruze, her story hero, who arrives at the critical moment in a hydroeroplane. “The scene was taken at Shippan Point, near Stamford, Conn., the cottagers and summer residents turning out to witness the young girl’s daring. Miss La Badie has probably more actual picture thrills to her credit than any leading woman on the screen. Asked as to the sensations she felt, as she hurled herself from the speeding hydroplane, Miss La Badie calmly commented: ‘I only remember I lost my breath when I struck the water. The rest of it was fine. 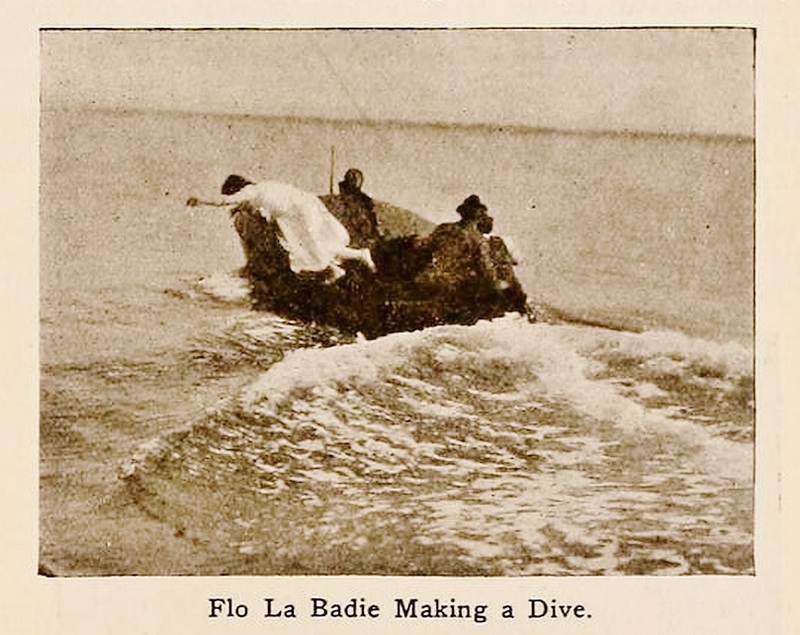 '” “Miss La Badie Makes Some Jump,” The Moving Picture World, August 15, 1914. Florence La Badie left Biograph during the summer of 1911 and almost immediately found a niche with the independent film producer Thanhouser. La Badie never articulated publicly the reasons for leaving her first film employer after a mere six months. However, we may cautiously speculate that her motives were not so different from her predecessors in flight from Biograph — better (i.e., leading) roles and name recognition. In little more than six months with Thanhouser she would have both. 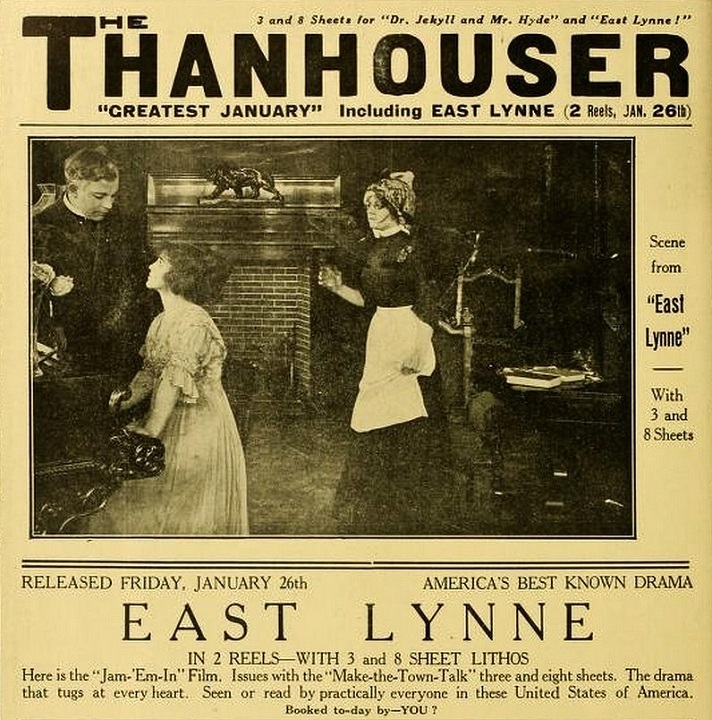 Founded by Edwin Thanhouser, a veteran theatrical producer, and based in New Rochelle, New York, Thanhouser was a later entry among the independents. 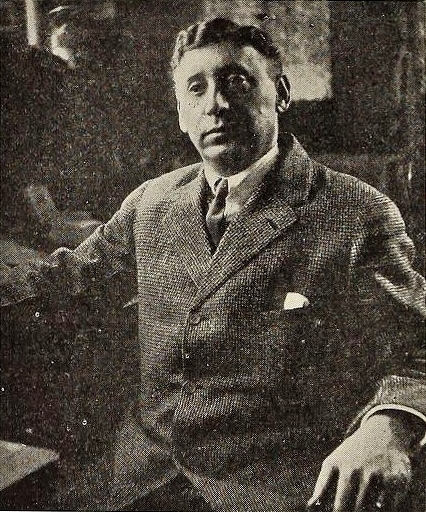 Convinced he “could produce better pictures than the majority of those I have seen,” Thanhouser had first applied for a license with the Motion Picture Patents Company (MPPC), the film production trust or cartel organized in December, 1908 to essentially protect the Edison film manufacturing patents. The MPPC consisted of filmmakers who paid licensing fees to the Edison Film Manufacturing Company for the right to use patented Edison equipment, in effect giving its members a stranglehold, if not a monopoly, on film production in the United States. Denied his request for a license due to his lack of a manufacturing plant and his inexperience in the field, Thanhouser invested in a new plant, purchased European-made equipment — the Bianchi camera — and began releasing films as an independent producer in March, 1910. Thanhouser drew upon his theatrical experience to assemble a stock company of actors and, unlike the MPPC members, released the names of actors (and technicians as well) through the trade papers such as The Moving Picture World from the time of the company’s first releases. However, like other producers, both MPPC and independents, players names were not yet used to advertise the product, relying instead upon the “brand” name of the manufacturer and the story to sell the pictures. As the independents grew in number, they lured actors from the patents companies. Particularly vulnerable was Biograph which, in addition to their policy of strict anonymity, did not always secure the services of their on-screen talent with fixed contracts. Not long after returning to New York from California with the Biograph company of actors in late spring of 1911, Florence La Badie appeared at the offices of Thanhouser looking for work. 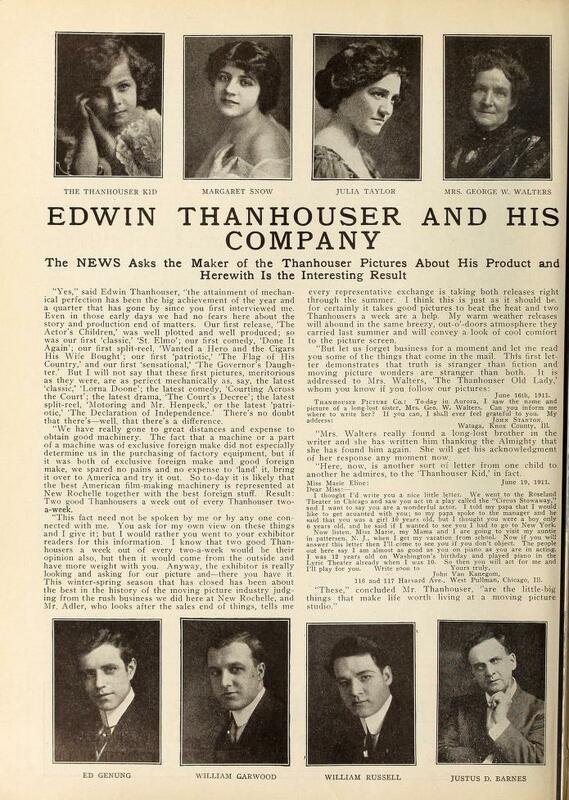 She may have noticed that Thanhouser had recently publicized their stock company of actors in The Moving Picture News, a trade paper closely affiliated with the independent producers, in June 1911 (by contrast, Biograph would do nothing of the sort until two years later). “Dave [Thompson] noted the long-lashed, blue eyes under a big panama hat, and figured Miss LaBadie (he didn’t know her name) to be about 16 years old; and, with a glance, he took in the expressive dark eyebrows, the abundance of fluffy, light-brown hair and inwardly nailed the thought. ‘Gee! some eyes for pictures!’ He promised her nothing when she made her request, but took her New York address and said he would send for her. Florence, however, had played a small part in a Biograph; but it was the LaBadie touch she put to this minor part that caught Ed Thanhouser’s eye that night as he sat watching a photo-drama, and he remembered having seen Miss LaBadie at the studio that day. She made a strong impression on him; so much so that he didn’t wait for the next day to get next to Mr. Thompson, but telephoned him after the show and learnt that it was the girl he had in mind. The story, though quite appealing, has the feel of fan magazine fluff and could well be apocryphal. The 1910 date is clearly wrong — In the Chorus was released September 15, 1911, making it almost certain to have been shot during August, though not in the year 1910, as recalled by Thompson in the magazine interview. For the first Florence La Badie Thanhouser, available evidence points to The Smuggler [also referred to in some places as The Smugglers]. 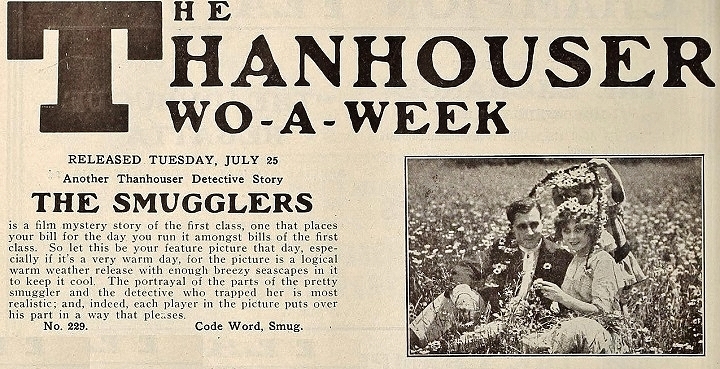 Released on July 25, 1911, the director of The Smuggler is not known. La Badie’s last Biograph, Bobby, the Coward, was shot June 1, 5, 9, and released July 13, 1911. If she left Biograph not long after shooting Bobby, the Coward in mid-June, then The Smuggler fits perfectly as her Thanhouser debut. Complicating these matters, of course, is the fact that most of La Badie’s work with Thanhouser, including The Smuggler, is lost — only twelve films survive out of more than a hundred. We are left with little more than press advertisements, story synopses and reviews to document their existence. 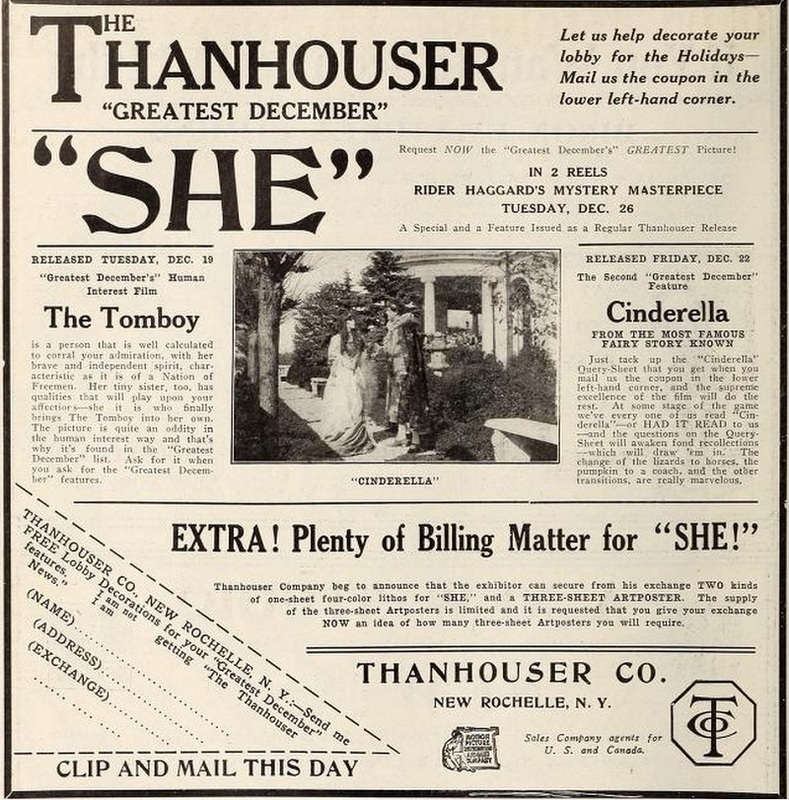 Fortunately, Thanhouser promoted their product aggressively with ads placed conspicuously just inside the front covers of the two most important weekly trade papers, The Moving Picture World and The Moving Picture News. Though the ads did not yet mention actors’ names, they usually included a still photo from the film. In most cases the photos assist us in proving the appearance of an actor in the film though, as we shall see, not always with certainty. 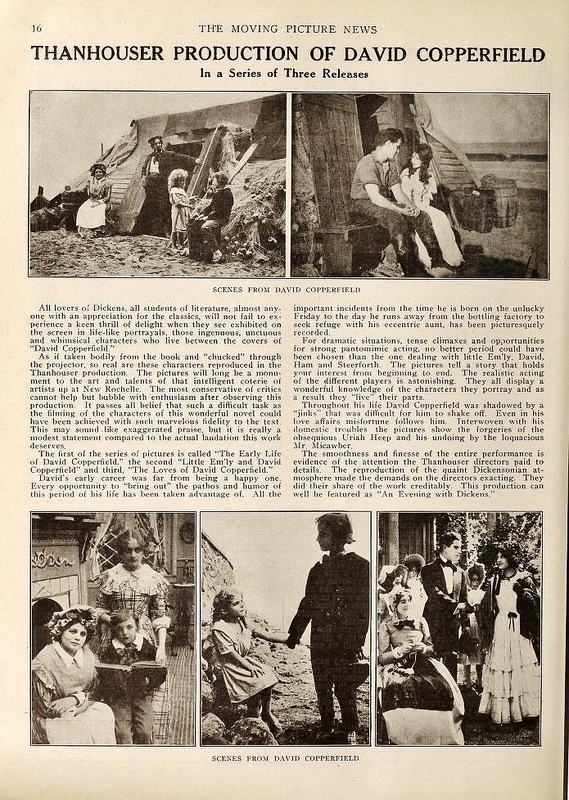 “The story is consistently conceived, but while the actors move with grace and poise before the camera in a satisfying and pleasing style, [the film] has not the more subtle quality that one sees in some other films.” Review of “The Smugglers,” The New York Dramatic Mirror, July 26, 1911. 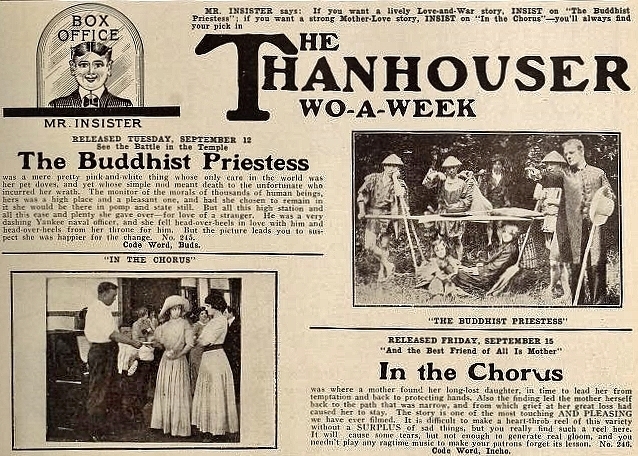 The second and third films La Badie completed for Thanhouser were The Buddhist Priestess and In the Chorus, both released the same week in September, 1911. The former featured Thanhouser “veteran” Marguerite Snow in the title role, with La Badie apparently in a minor bit (though the woman in the ad photo bears a closer resemblance to La Badie than Snow). An important event in the development of the star system in motion pictures occurred on October 14, 1911. That evening, the Motion Picture Distributing and Sales Company held their second annual “Sales Company Employees Ball” at the Alhambra Hall in Manhattan. The Sales Company was created in 1910 by a group of independent film producers, including IMP’s Carl Laemmle, as the primary marketer and distributor for the independents. The Sales Company used the Ball to promote not only the producers’ brands, but the motion picture players themselves. According to The Moving Picture World, “the attendance of all film actors will be compulsory.” (MPW, September 23, 1911, emphasis added.) It was a clear indication that the industry recognized the increasing popularity of film actors, who until 1911 were largely anonymous to the general public, and that they were becoming a key selling point for their product. In the following years this would be reflected in advertisements, press releases and the growth of the motion picture fan magazines. Promotion of movie “stars” would begin in earnest. Both The Moving Picture World and The Moving Picture News noted among the Thanhouser representatives at the Ball the presence of Florence La Badie. As the popularity of industry “balls” grew in the next few years, La Badie would not merely attend, but would become a centerpiece of these events. 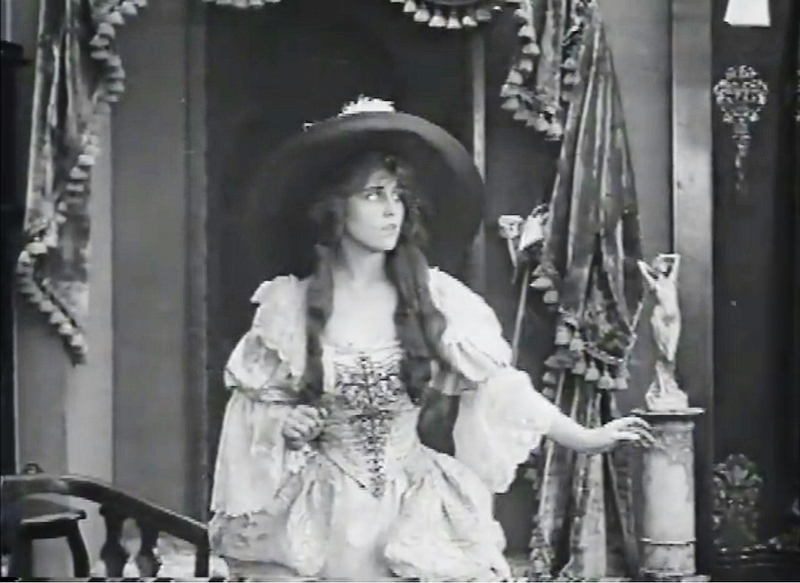 At about the same time, Florence La Badie received the most important role of her nascent film career in Thanhouser’s biggest production to date, David Copperfield, a three reel film directed by Biograph veteran actor-turned-director George O. Nichols, and released on consecutive weeks in three installments, The Early Life of David Copperfield, Little Em’ly and David Copperfield, and The Loves of David Copperfield. 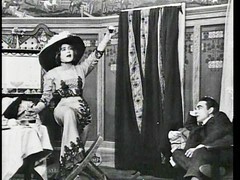 La Badie portrayed “Little Em’ly” in the second part, opposite Ed Genung as David. 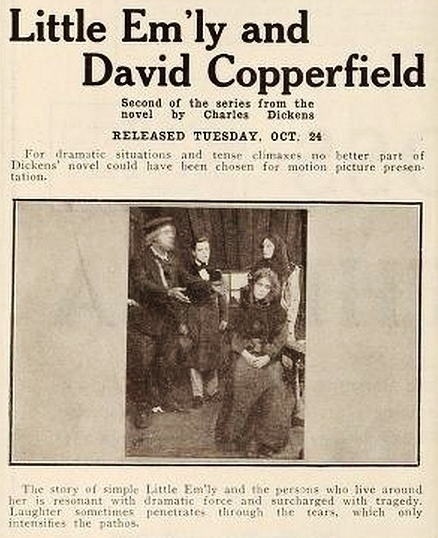 Little Em’ly and David Copperfield was released October 24, 1911. Unlike her first three films for Thanhouser, the three reels of David Copperfield survive. David Copperfield‘s “Little Em’ly” would be her most significant role to date. However, it was an original Thanhouser melodrama released the same week, a film with vaguely anti-Semitic overtones, that would give Florence La Badie her first name recognition in a specific film — and first rave review — in the motion picture press. 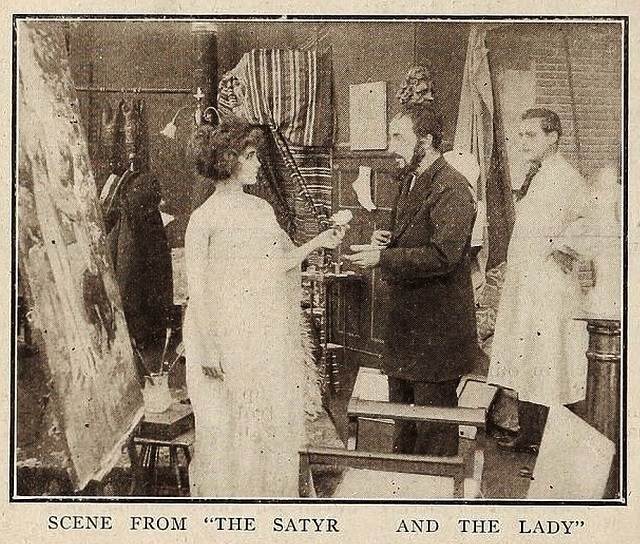 The Satyr and the Lady was released October 20, 1911, and featured La Badie as an artist’s model posing for a painting of “the Satyr and the Lady.” The artist (Harry Benham) finds his subject for the “Satyr” in the ghetto of New York’s Lower East Side, a “shoestring peddler” with a young daughter (played by Marie Eline, aka “The Thanhouser Kid”). The peddler (David Thompson) is grateful for the extra money that helps him feed his starving child. But after their modeling jobs are finished, the peddler becomes gravely ill and desires to find a suitable guardian for his child. Thinking the model to be a virtuous woman — she is actually a prostitute — he believes she would make an ideal “mother,” and writes to her. She arrives at the peddler’s tenement dwelling, finds him dead and, feeling pity for the child, takes custody of the girl. The artist then convinces his “model” to give up her errant ways. 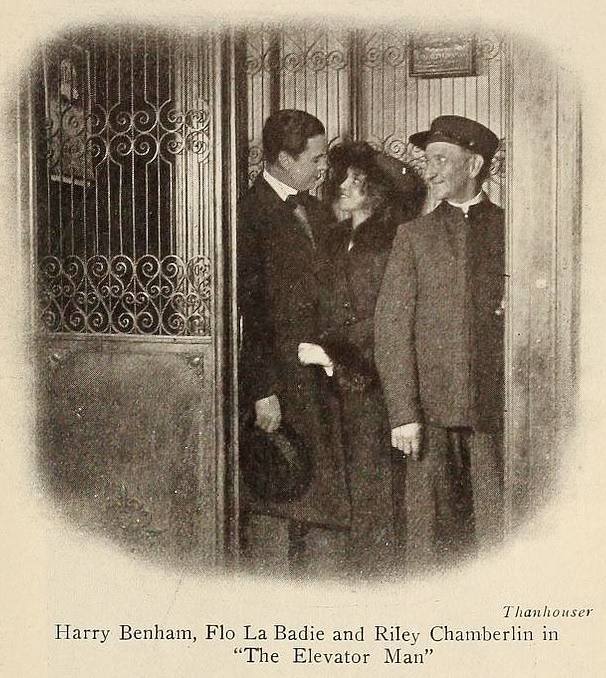 Florence La Badie, David Thompson (the man at least partly responsible for hiring La Badie at Thanhouser), and Harry Benham in The Satyr and the Lady (released Oct. 20, 1911). 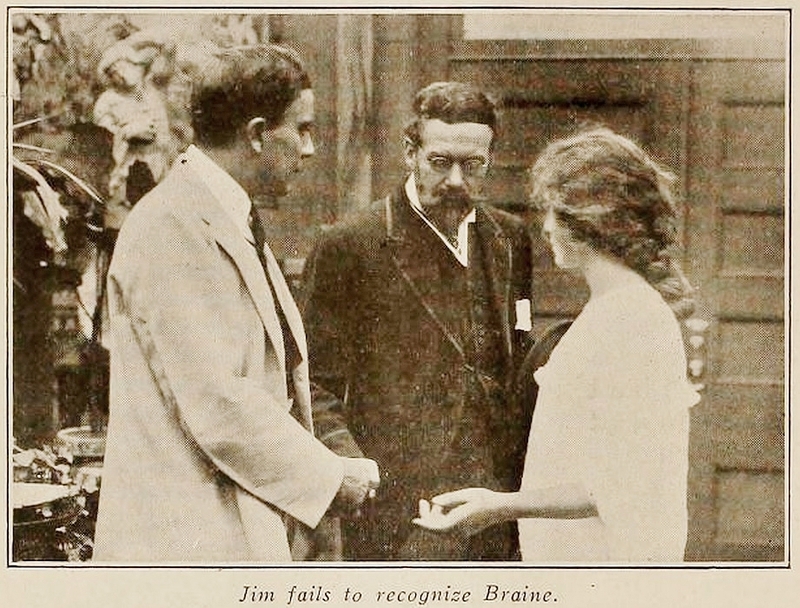 This photo appeared with an article on the film in The Moving Picture News, Oct. 7, 1911. 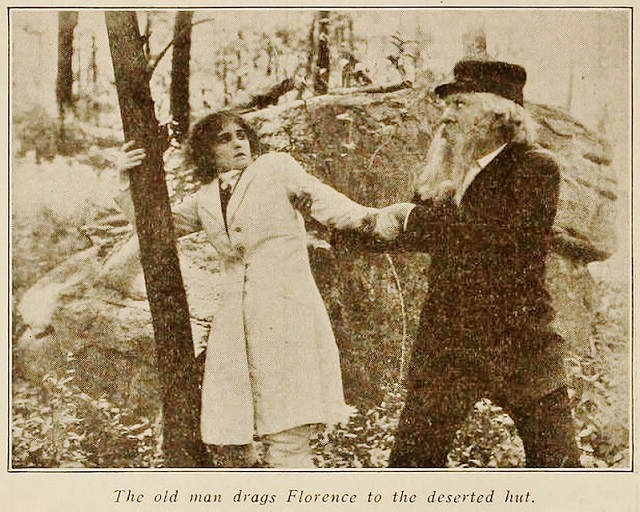 After a role as one of the daughters in Thanhouser’s adaptation of The Last of the Mohicans, released November 10, 1911, Florence La Badie played a leading role in the melodrama, A Mother’s Faith. 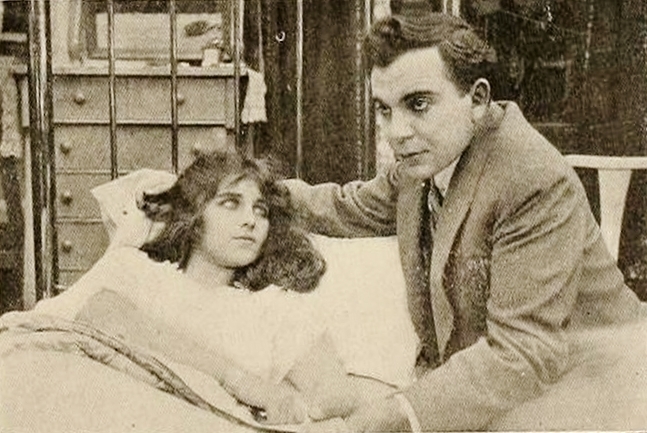 Above, James Cruze and Florence La Badie as the brother and sister in A Mother’s Faith (from Thanhouser ad in The Moving Picture News, November 4, 1911). 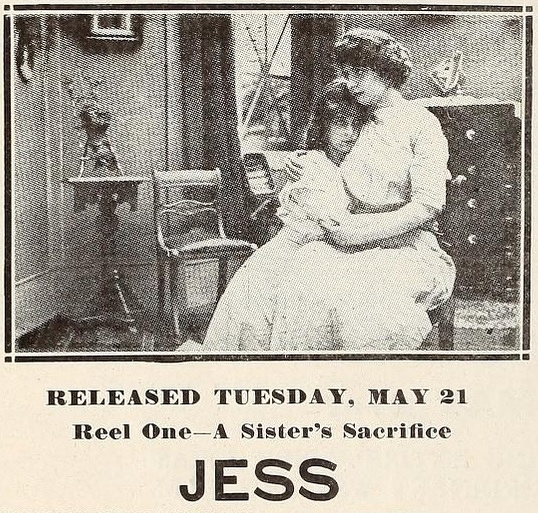 Released November 17, A Mother’s Faith cast La Badie as the sister of a young man (James Cruze) who is expelled from his wealthy family’s home by his father. Upon learning of his father’s death, the son, now a tramp, returns home. He is refused entrance to the home by his sister. Through a window he sees his mother weeping over his photograph, and vows to straighten out his life. He gets a job, makes a respectable man of himself, and returns to ask his mother’s pardon. It was not a modern melodrama, but rather, a classic fairy tale that gave Florence La Badie the most memorable role of her young career. With a Christmastime release, Cinderella was a single reel film that proved as popular as any of the multi-reel prestige pictures Thanhouser had created throughout 1911 (including She, the most heavily promoted Thanhouser film of the holiday season). After nearly one year in motion pictures, La Badie had for the first time a role that was truly central to a film. Because the story was (and is) so well known to audiences, one imagines that their expectations might actually have been greater than normal for the actress — could she be the girl of storybook imagination? A natural, unaffected and charming performance combined with her obvious physical beauty made her the ideal embodiment of the fairy tale drudge-turned-princess. Fortunately, this Cinderella survives. 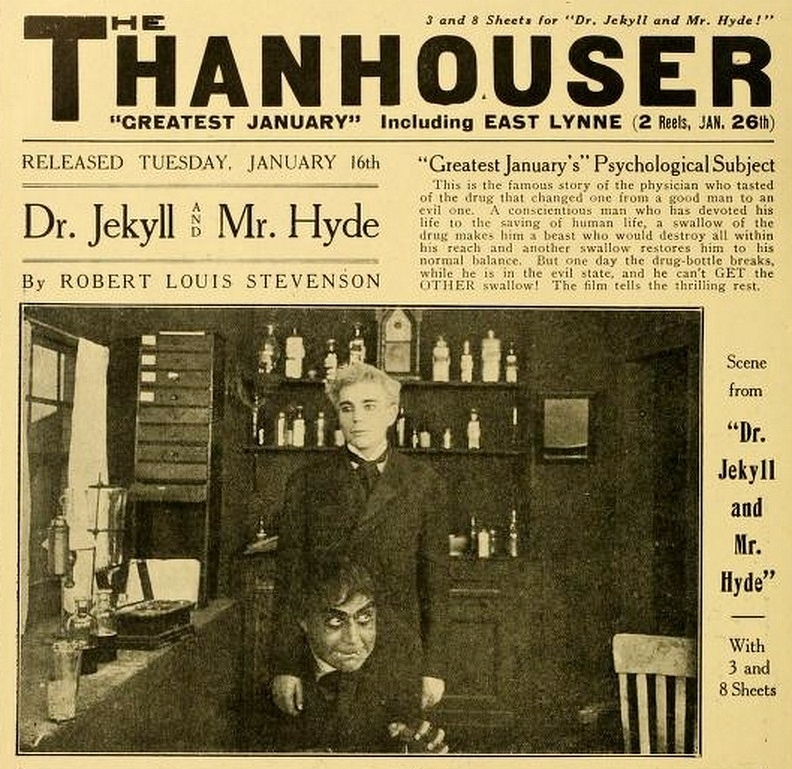 January 1912 proved to be Florence La Badie’s most productive month to date with Thanhouser, beginning with the studio’s one-reel adaptation of the Robert Louis Stevenson classic, Dr. Jekyll and Mr. Hyde, another surviving Thanhouser film. La Badie’s next major role came in a film based on a classic of its time — but one that is largely forgotten today. East Lynne (dir. George O. Nichols), originally an 1861 English novel by Ellen Wood, and adapted for the stage in the same year, was among the most frequently produced Victorian melodramas over the following half century. It was staple of the theater and familiar to stock company actors across America, including D. W. Griffith and Edwin Thanhouser. A year earlier, in January 1911, Florence La Badie had accepted D. W. Griffith’s invitation to travel with the Biograph company to California. Now, in mid-January, 1912, she was one of the Thanhouser “stock company” of players sent to Florida for the winter. Included in the Florida company was Marguerite Snow, with whom La Badie would alternate playing leads, and director George O. Nichols. 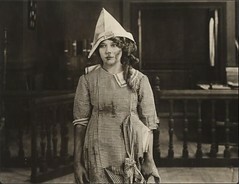 Prior to leaving for the south, La Badie had prominent roles in two more films shot in January and released in early February. The Trouble Maker, released February 6, featured her with William Russell as a married couple who grow suddenly rich, break apart, then reunite. 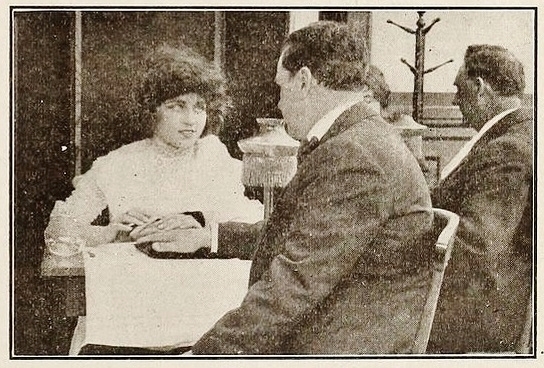 The Moving Picture World review named both actors and, although not specifically critiquing their performances, called the film “a first-class feature.” (MPW, Feb. 17, 1912). Note that the word “feature” was often used rather loosely at this point, and could encompass films such as this one-reeler that were deemed worthy of heading an evening’s program for an exhibitor. 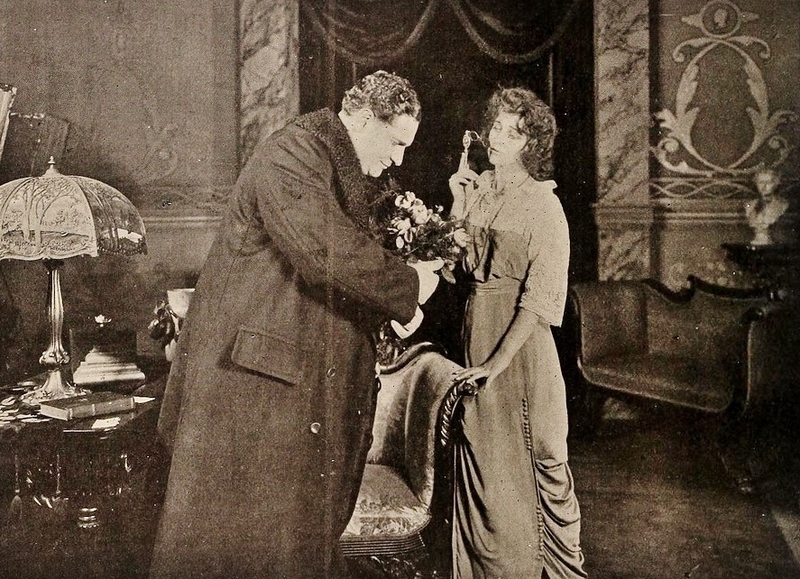 Florence La Badie and William Russell in Thanhouser’s ad for The Trouble Maker, from The Moving Picture News, January 27, 1912. 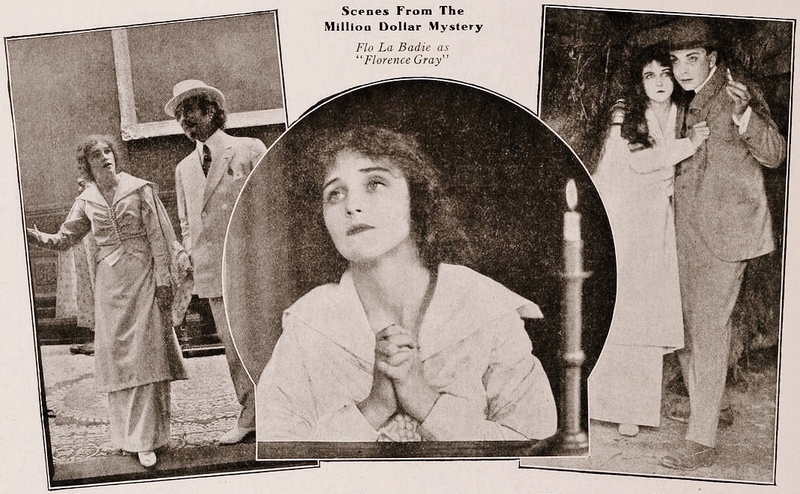 In The Silent Witness, released February 13, La Badie played the wife of a man (Russell) wrongly prosecuted for a murder committed by the district attorney — “a very commendable melodrama, closely knit, artistically staged and acted, exciting and well photographed.” (MPW, Feb. 2, 1912.). William Russell and Florence La Badie in an ad for The Silent Witness, from The Moving Picture News, February 3, 1912. 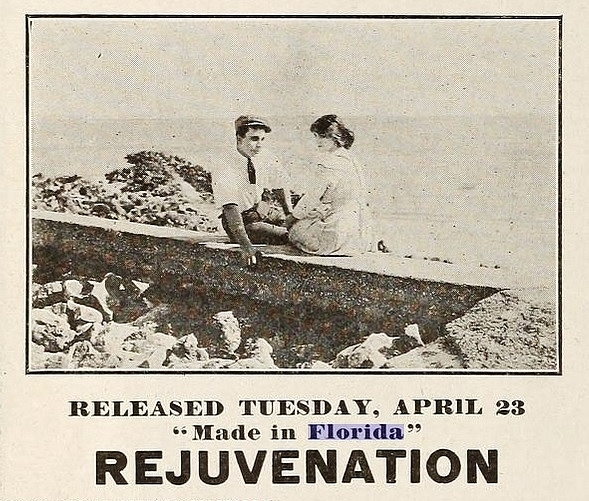 The Florida Thanhouser company took advantage of the subtropical location for their first film, The Arab’s Bride (dir. George O. Nichols), released March 1. Florence La Badie played the daughter of a wealthy “moor” (James Cruze) who has arranged her marriage to a rich man (Joseph Graybill). While shopping in the marketplace, she falls in love with a rug-weaver (William Russell). When the time comes for the girl to be delivered in marriage, she manages, with the help of her servant, to elude the ceremony and is carried off by her true love . William Russell and Florence La Badie in The Arab’s Bride, Thanhouser ad in The Moving Picture News, February 17, 1912. Florence La Badie and William Russell in a promotional photo for The Arab’s Bride, from an article in The Moving Picture News, February 17, 1912. In Extravagance (dir. George O. Nichols), released March 5, La Badie plays the spoiled daughter of a prosperous merchant who goes deeply into debt to provide her every whim. They move from a modest country home to a mansion in the city, and she forsakes her old friends and her country sweetheart (William Russell). When her father’s bankruptcy pushes him to the brink of suicide, her former sweetheart intercedes, and she gladly gives up her extravagant ways, reuniting with the boyfriend. William Russell and Florence La Badie in a Thanhouser ad for Extravagance, from The Moving Picture News, February 24, 1912. 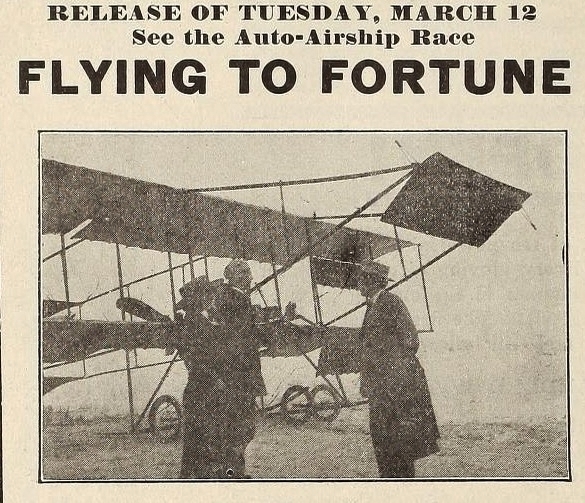 Marguerite Snow, Florence La Badie and James Cruze in a scene from Flying to Fortune, from the Moving Picture News, Mar 2 1912. The Girl of the Grove (dir. George O. Nichols), released April 3, used another Florida backdrop, an orange grove, for a tale of love, deception — and two suicides averted. La Badie plays a “self-reliant girl” who manages the orange grove inherited from her father. She falls in love with a man (Joseph Graybill) who has deceived her into thinking he is unmarried, but she learns by accident that he has a wife (Marguerite Snow) who is handicapped. The girl is disconsolate and decides to drown herself in the ocean. Before she can commit the act, she sees another woman leap into the water — the woman who is the wife of her deceitful suitor. She jumps into the water (one wonders if this was La Badie’s first such stunt), saves the wife and takes her to her home in the grove to nurse her back to health. The wife tells her the story of her unfaithful husband and the girl makes the connection. The husband, thinking his wife dead, visits the girl to discuss marriage. She leads him to the wife, who is asleep, explains that she saved the woman’s life, and commands the man to depart forever. Florence La Badie, James Cruze, Joseph Graybill and Marguerite Snow in a publicity photo for The Girl of the Grove, from an ad in The Moving Picture News, March 27, 1912. 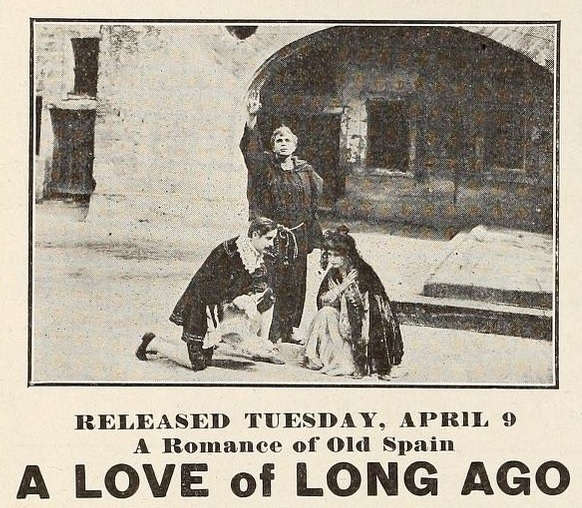 Florence La Badie with Joseph Graybill in Thanhouser’s ad for A Love of Long Ago, in The Moving Picture World, April 6, 1912. The scene where the lighthouse keeper’s daughter rescues the the boatman required La Badie to swim out to the drifting boat from the shore. 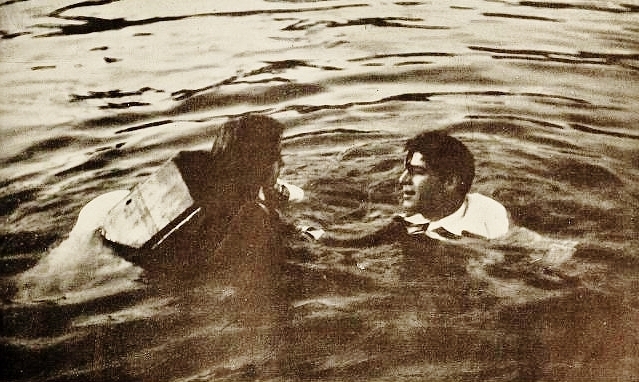 Along with the ocean rescue scene in The Girl of the Grove, this may have been another early stunt performed by the actress who would soon earn a reputation as a daredevil. “[Thanhouser publicity director] Bert Adler said he would show me to the prettiest player in the pictures, and then introduced me to Flo La Badie. She is! And the most wonderfully gowned girl I have ever seen at a function.” “Roving Commissioner,” in The Moving Picture News, April 20, 1912. 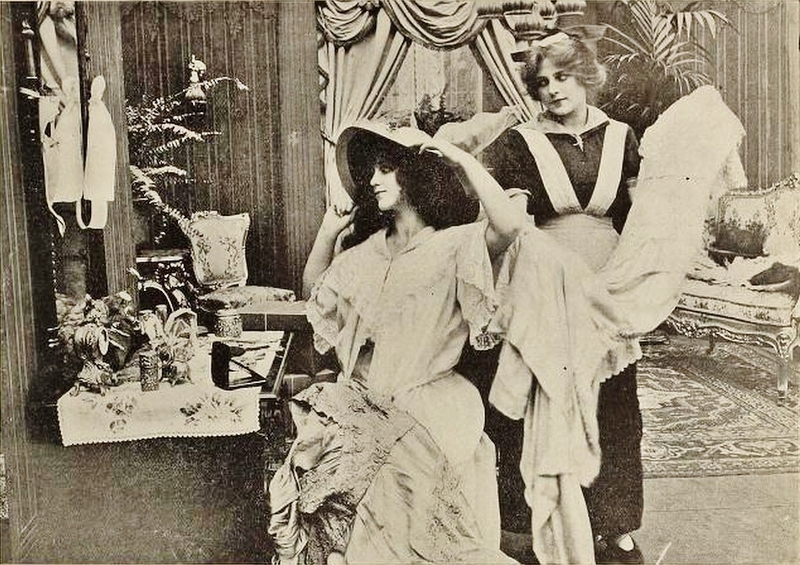 Florence La Badie (center) in Jess, publicity photo in The Moving Picture World, May 18 1912. Called Back (dir. George O. Nichols), adapted from a popular 1890’s novel, is an improbably convoluted melodrama of murder, temporary insanity, amnesia and blindness. A young man (James Cruze) suffering from a sudden onset of blindness accidentally “witnesses” the murder of a young woman’s (Florence La Badie) brother. He has become obsessed with the young woman and, after regaining his sight, follows her to Italy where, unknown to him, she has gone insane and has no memory of the once-blind man or the identity of her brother’s killer. Not realizing she is insane (! ), he marries her, and they return to America. She sees the murderer (David Thompson), recognizes him, and her memories of the murder and her once-blind husband come flooding back. She regains her sanity, the murderer is brought to justice and the woman, though surprised to be married, is content. 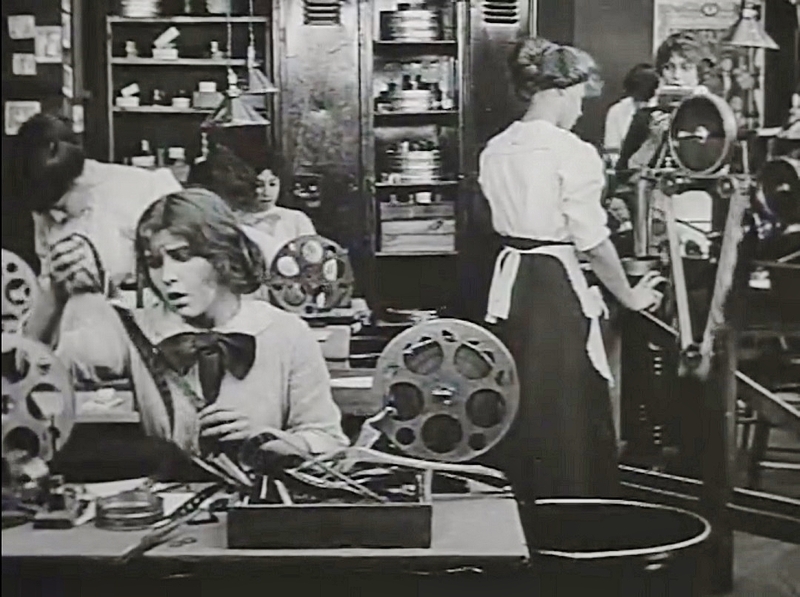 And it was all crammed into a mere two reels released June 21, 1912. The Moving Picture World praised the performance of James Cruze, particularly his portrayal of the character’s blindness. Florence La Badie and (center) David Thompson in a publicity photo for Called Back, from The Moving Picture World, June 15, 1912. 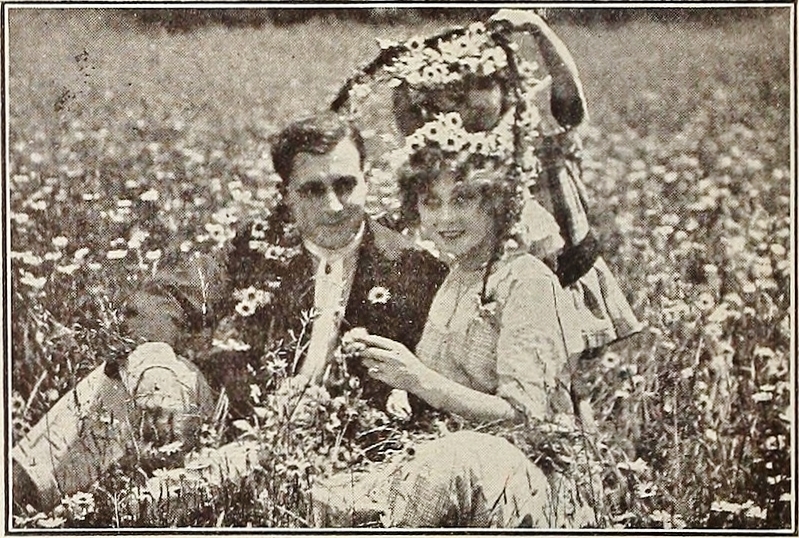 In Blossom Time, released June 25, La Badie portrayed a country girl, happy among the apple blossoms of her rural home. A wealthy aunt offers her the chance to live in the city and she accepts, soon becoming used to the pleasures and attractions of city life. But a bouquet of blossoms sent her from her former beau makes her realize that she misses the simple charms of country life, and she returns to her true home and love. Florence La Badie in a Thanhouser ad for In Blossom Time, from The Motion Picture News, June 15, 1912. Ma and Dad, a comedy of romance and deception, was released July 5. La Badie plays a Manicure Girl — a standard “gold-digger” character of the period — who pretends to be an urban sophisticate with her clients by day, but each night returns home to her mother’s chicken farm in the rural Bronx (it was “the country” in 1912). Her boyfriend presents himself as former college athletic star — in reality he spent a mere two weeks at school. They both lie about their single parents — her “Ma” a countess, his “Dad” a blue-blood. Rather than have each other discover the truth, the young couple elope. In the meantime, their parents accidentally meet, fall in love and also marry; their children return home from their honeymoon to find the new family arrangement. Under Two Flags (dir. 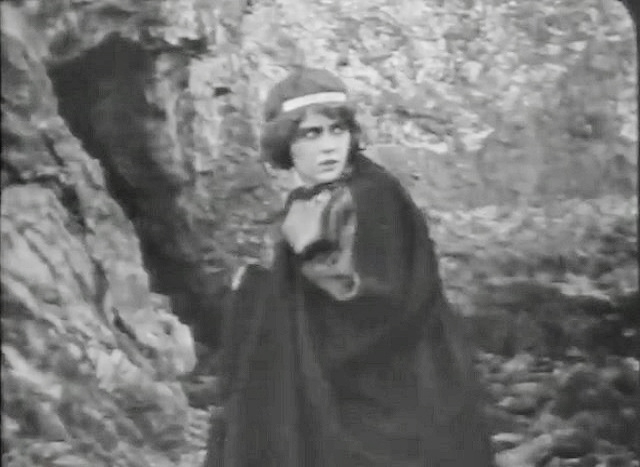 Lucius J. Henderson), released in two reels on July 7, 1912, was Thanhouser’s adaptation of an 1867 novel by Ouida (Maria Louise de la Ramée), a tale of the adventures and romances of an English soldier who is forced by scandal to flee his country and join the French foreign legion in Algeria. Florence La Badie played the second female lead, his English girlfriend who finds him in Africa. 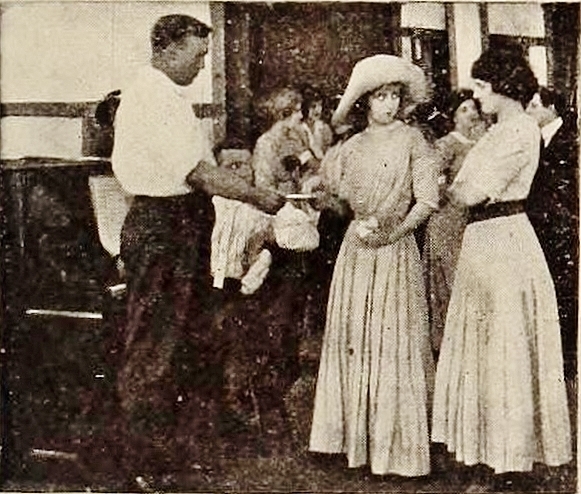 William Garwood, Florence La Badie and Katherine Horn, Under Two Flags, publicity photo in The Moving Picture News, July 6, 1912. The Portrait of Lady Anne, released July 23, is a surviving film that gives Florence La Badie the chance to play dual roles — the beautiful Lady Anne of more than a hundred years ago and her look-alike descendant. The Lady Anne, living in the late 18th century, has a serious quarrel with a suitor (William Russell) who is so devastated he goes off to war and is killed. Lady Anne marries another and has a child, but is unable to forget her lost love and dies presumably of a broken heart. Her present-day descendant, a young woman who bears a close resemblance to Lady Anne, keeps an original, full-length portrait of her ancestor in her home, as well as a dress and hat worn by Lady Anne in the painting. At a costume party at her home, the young woman wears Anne’s dress. After quarreling with her boyfriend (Harry Benham), she retreats to her bedroom and removes the dress, but finds an old note that Anne’s suitor had left after their breakup. As she gazes outside from her balcony, she sees him dancing with another — the spirit of Lady Anne who has emerged from her portrait to intercede. The boyfriend not realizing he is dancing with a spirit, believes their quarrel is over. The young woman puts the dress back on, goes downstairs and makes up with her boyfriend. The spirit of Lady Anne, having accomplished her task, returns to her place in the portrait. 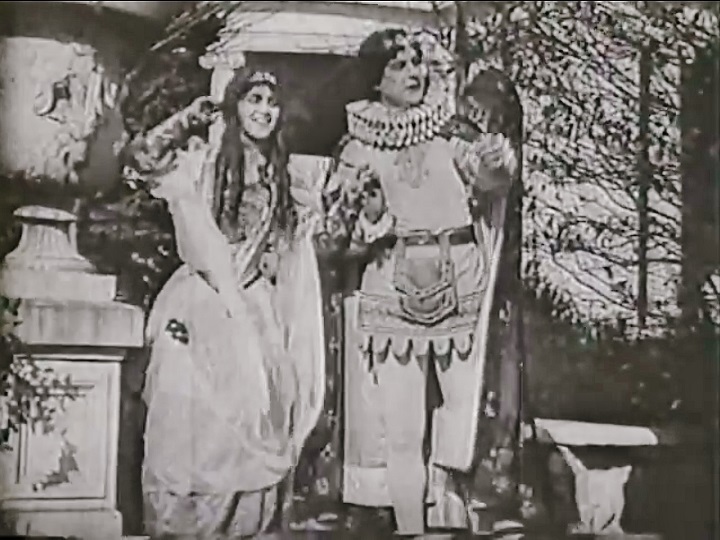 Above, Florence La Badie as The Lady Anne and Carl Le Viness as the man she unhappily marries. Below, The Lady Anne emerges from the portrait. Above, the descendant of The Lady Anne sees, below, the spirit of Anne with her suitor (Harry Benham). Florence La Badie (at far right) as Portia in The Merchant of Venice, photo from The Moving Picture News, July 13, 1912. Florence La Badie followed The Merchant of Venice with supporting roles in two films. One of these was a dramatic adaptation of a 19th century poem, Lucile (dir. 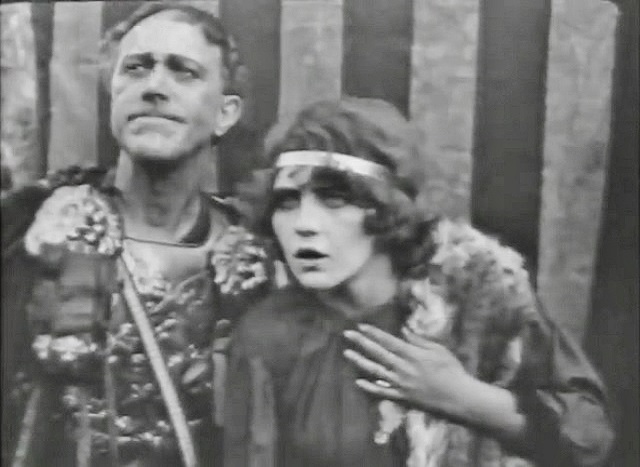 Lucius J. Henderson), starring Marguerite Snow in the title role, and La Badie as her sister Matilda. Lucile was released in three reels, the first two reels on August 27, and the third on August 30. The other was Big Sister, released August 11, in which La Badie played a society woman who takes in the baby sister of a poor woman (Mignon Anderson) who can no longer care for the child. But the woman — the “big sister” — obtains a position of servant in the wealthy woman’s household and, when the woman meets a policeman and marries, she is able to regain custody of her sister. 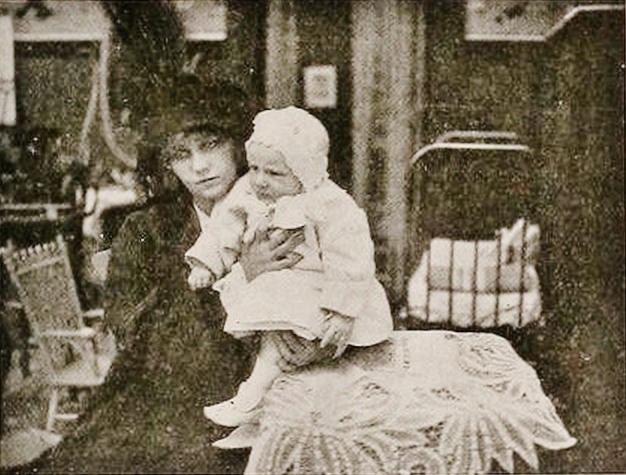 Mignon Anderson (as the servant and “big sister”) and Florence La Badie (as the society woman) in Big Sister, Thanhouser ad in The Moving Picture World, August 10, 1912. 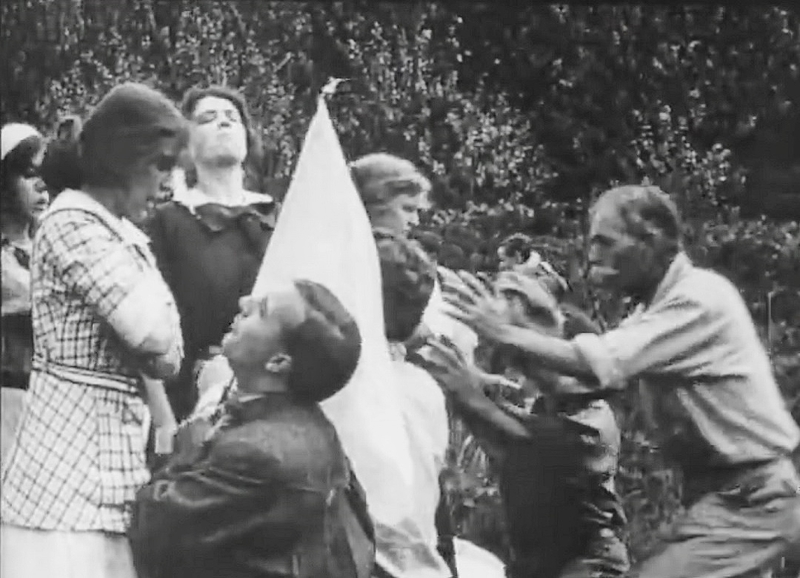 The Voice of Conscience, a surviving film released September 3, 1912, is an odd tale of an orphaned girl (Jean Darnell) sent to live with the mother of her late father’s friend (Harry Benham). The orphan girl develops an obsession for the friend until one day another young woman (Florence La Badie) arrives to visit, causing the obsession to become extreme jealousy when the friend devotes all his attention to the new arrival. The three are involved in an auto accident in which both girls are injured, the new girl seriously. In the hospital, while in adjacent beds, the orphaned girl watches as the other, unconscious, is given a powerful medicine by her doctor, an excess of which could result in death. When she thinks no one is looking the orphan pours more of the medicine in the girl’s glass in order to kill her. However, the doctor has witnessed the act, and sets up a ruse to trick the orphan into believing he has administered the overdose and the girl has died. 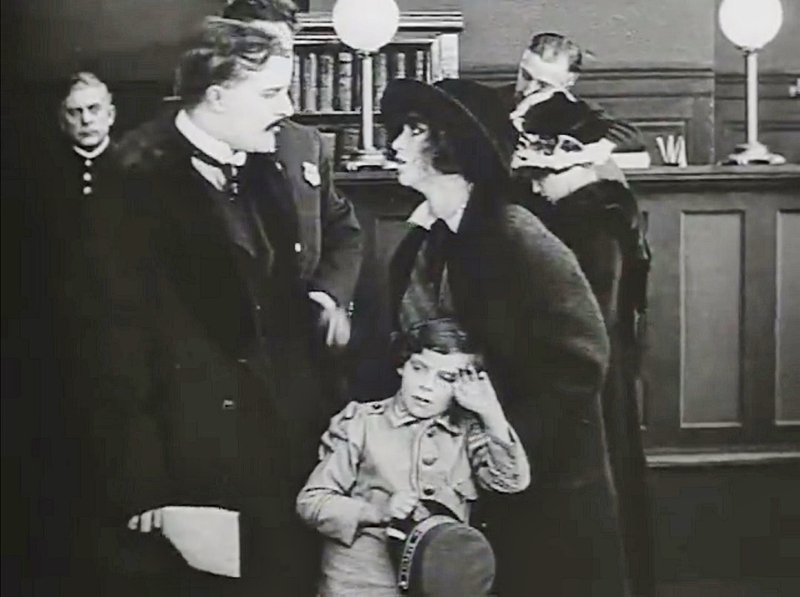 Later, after the girl has recovered and the orphan remains hospitalized, the doctor arranges a meeting at the hospital with the girl, the man who is now her fiance, and the orphan. Seeing the girl alive, the orphan confesses her attempted crime and repents — all is forgiven. The three go for an automobile ride that will have near-disastrous consequences. 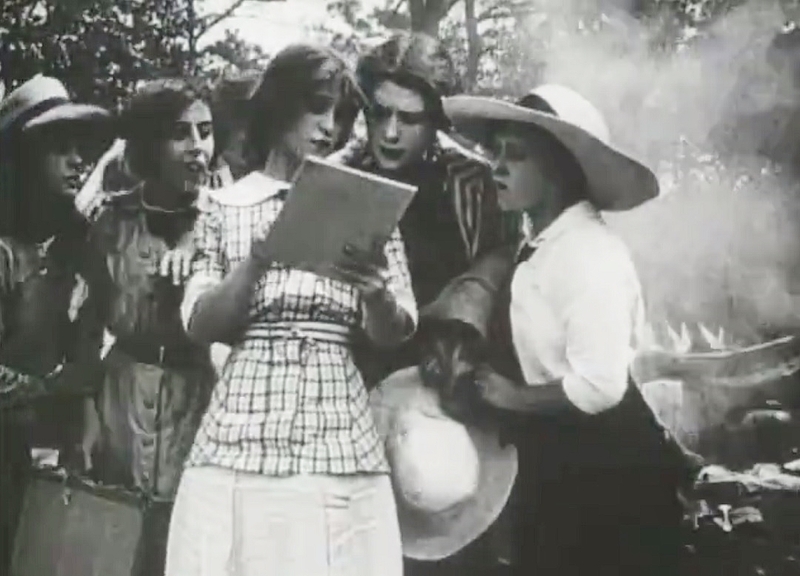 The girl (Florence La Badie, center) and the orphan are hospitalized with serious injuries. 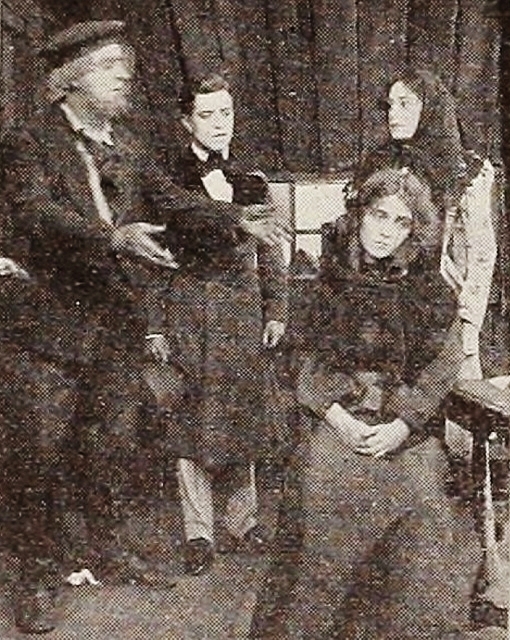 The doctor (center) arranges a meeting to show that the girl is alive, much to the shock — and relief — of the orphan. Undine (dir. 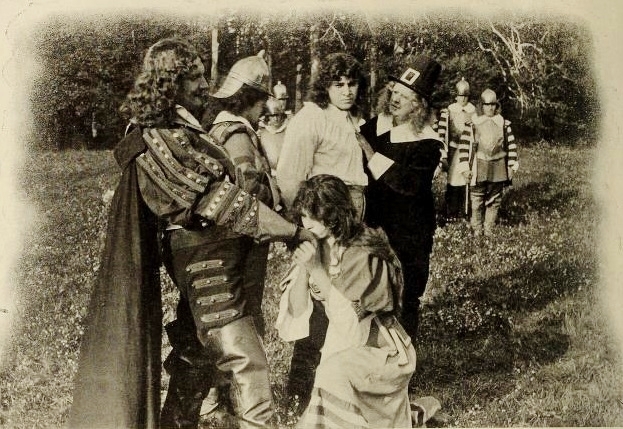 Lucius J. Henderson), released in two reels September 24, was yet another Thanhouser literary adaptation, this time of an early 19th century German romantic myth set in a medieval kingdom. 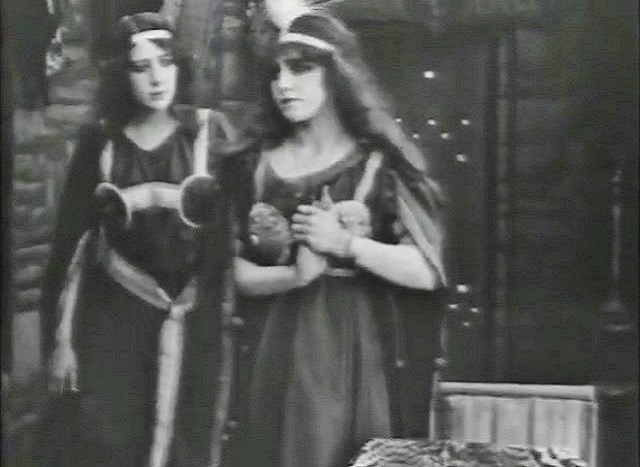 La Badie played the title role, a mysterious “water nymph” who loves a knight, the Lord Huldbrand (James Cruze), to the consternation of the Duke’s daughter Bertalda (Marguerite Snow), who desires the knight for herself. Florence La Badie as “Undine” the water nymph — on horseback! 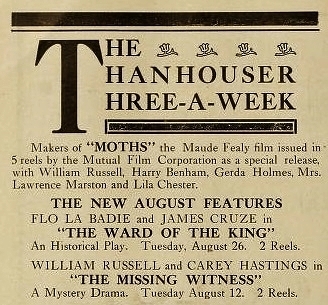 Detail from a Thanhouser ad in The Moving Picture World, September 21, 1912. Miss Robinson Crusoe, released October 8 in one and a half reels, featured Florence La Badie in a twist on the 18th century classic by Daniel Defoe. As a woman shipwrecked on an island of hostile natives, she was paired with James Cruze as her lover and rescuer. 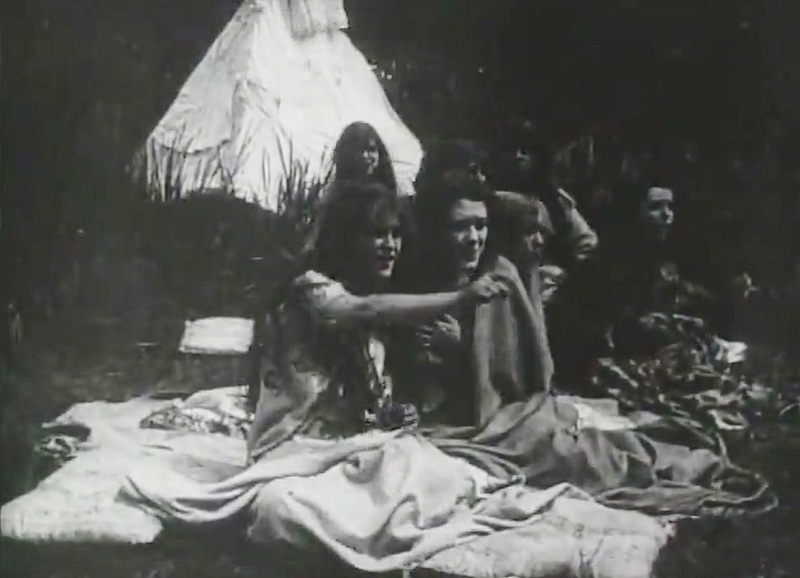 Petticoat Camp, a surviving film released November 3, was an ensemble comedy, an early “battle of the sexes” in which the women were decidedly the victors. 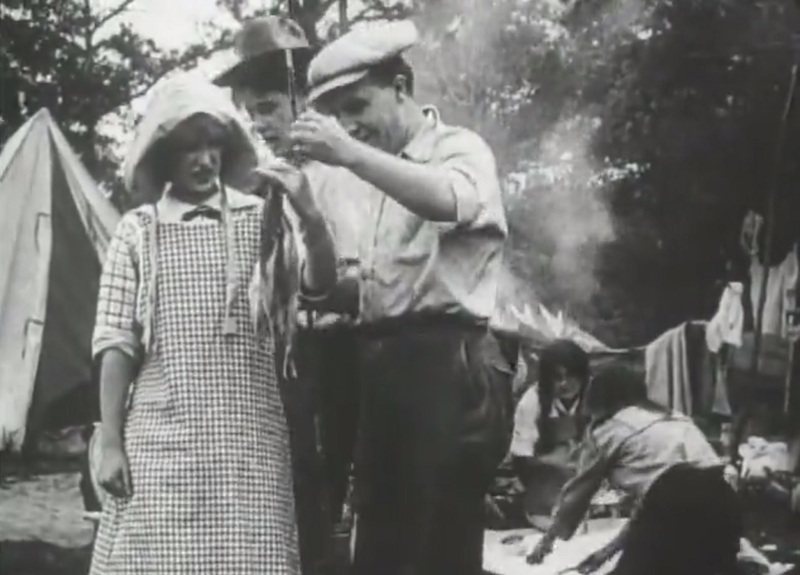 A group of married couples go camping on an island and, while the men thoroughly enjoy themselves, the women soon tire of being their servants. The wives strike back, finding their own little island spot nearby, leaving the men to their own devices. Miserable, the men decide to get even and scare the wives in a night ambush. The women are more than ready for the “attack,” defending themselves with pistols, and the men frantically retreat. 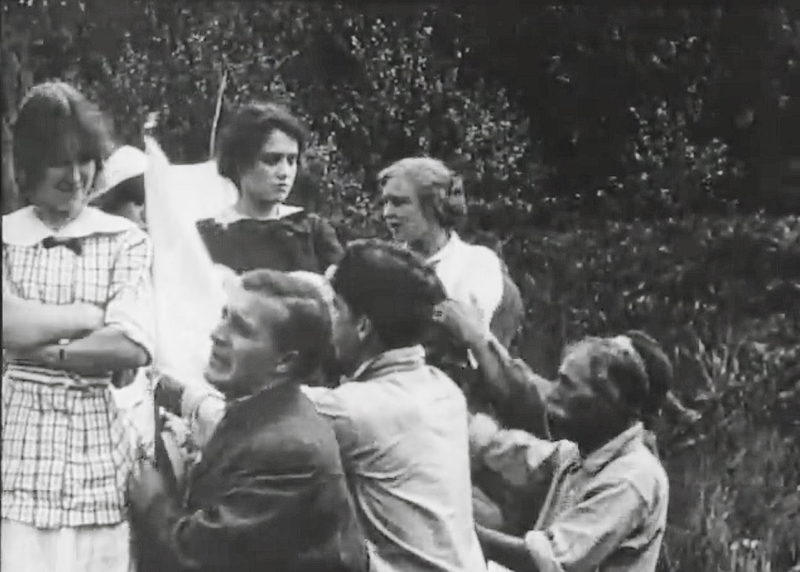 The next morning the men skulk back to the women’s camp waiving a white flag, gladly subservient to their wives. After being served breakfast, the men go fishing, leaving the wives behind. They return with their catch for the wives to clean. The wives write an emancipation note, telling the men they are leaving the bonds of slavery to seek their own fun; they canoe to another nearby island . . .
. . . and enjoy their freedom (the swimmers were played by the Jordan Sisters, “divers”); that night, the women spot the advancing “intruders” . . .
. . . thinking they’re in danger, they repel the menace with gunfire. The next morning . . .
. . . the men beg forgiveness, and the wives enjoy a reversal of roles. 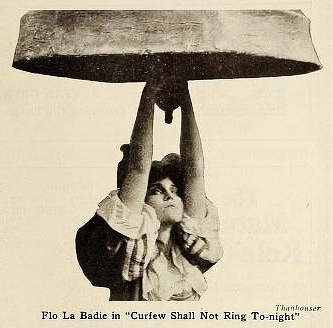 Florence La Badie closed out 1912 with lead roles in two multi-reel “feature” films. Aurora Floyd, released in two reels December 10, was Thanhouser’s adaptation of yet another 1860’s English novel, a wildly melodramatic story of the dire consequences of bad marriage in an upper class family. Aurora Floyd, daughter of a wealthy banker, marries her father’s servant who turns out to be an abusive drunkard. Her father bribes the man to leave the country and later learns of his death overseas. Aurora remarries — a man of whom her father approves, but who has no knowledge of her first marriage. Their happiness is jeopardized when she learns that her first husband is not really dead. He returns and blackmails her by threatening to expose her bigamy. After she pays his bribe, he is killed by a stable boy who steals the money. Aurora finds his body and the gun, and being seen in the vicinity of the murder, is charged with the crime. 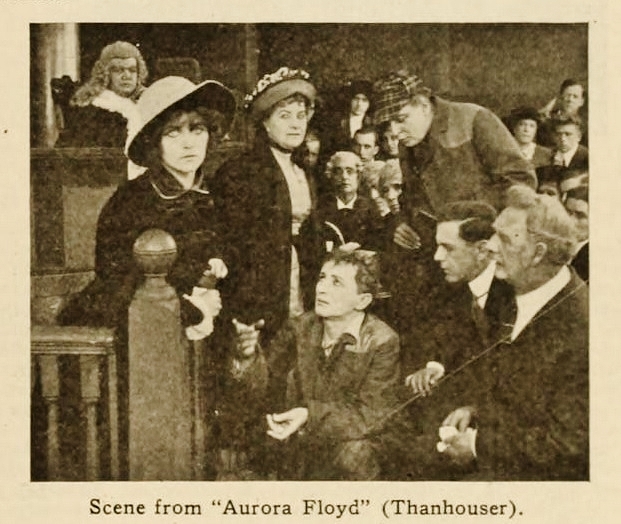 At trial she is convicted, but at the last minute the stable boy confesses and Aurora is released. Her husband remains loyal to her throughout the ordeal, and refuses her plea that he “forget” her. 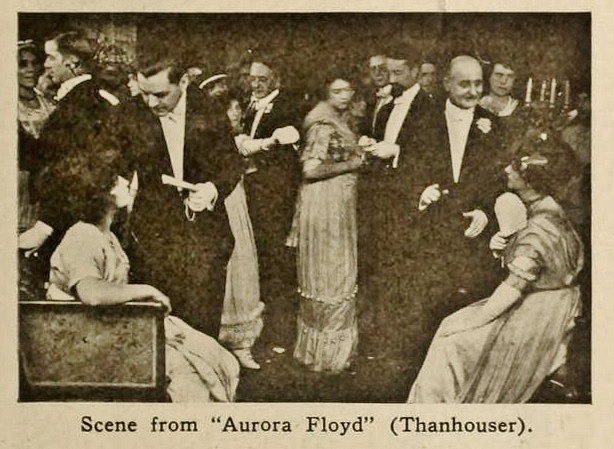 Florence La Badie is Aurora Floyd, detail from Thanhouser ad in The Moving Picture World, December 7, 1912. Above and below, Florence La Badie in Aurora Floyd, publicity stills from The Moving Picture World, December 14, 1912. 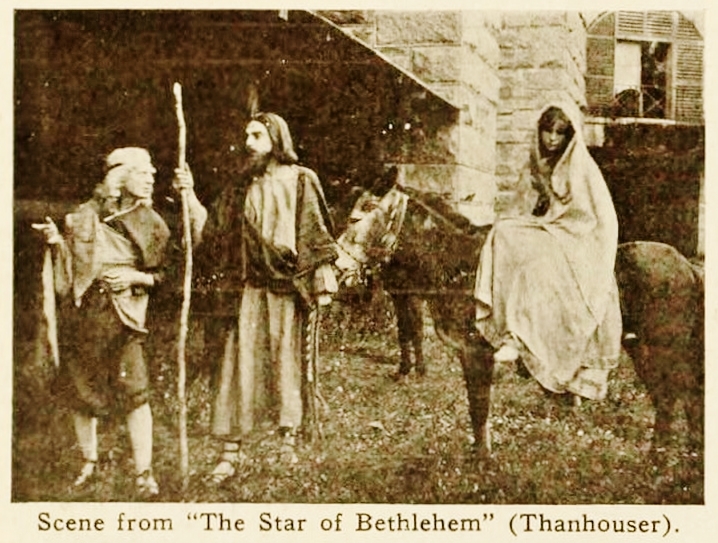 The last Thanhouser release for 1912 was the three-reel feature The Star of Bethlehem, released Christmas Eve. Beginning production in October, the completed film was promoted by Thanhouser as costing in excess of $8,000 and the final cut being culled from 7,000 feet of film. It was the first film directed by Lawrence Marston, a prominent stage director whose most recent success was the hit play, Kismet (1911-12), and who would go on to direct Abie’s Irish Rose, the longest-running Broadway stage hit of the 1920s. Florence La Badie had what many would consider the most memorable role of her entire film career, the Virgin Mary, though one suspects this was largely due to the popularity of the film as an annual Christmas re-release in subsequent years. The Star of Bethlehem received generally positive reviews for its reverent treatment of the subject matter. Too reverent for The Moving Picture World‘s W. Stephen Bush, who gave the film a blistering review in which he faulted the film in every aspect. “In this three-reel production I have been able to discover but few and faint traces of the old [Thanhouser] skill. I fully realize that some latitude must be allowed to the producer of a sacred historical picture – if you succeed the limit in creating a true atmosphere and keeping within the limits of the probable, he is doing all that can under ordinary circumstances be expected of him. I do not think that the producers in this instance have succeeded in either respect. 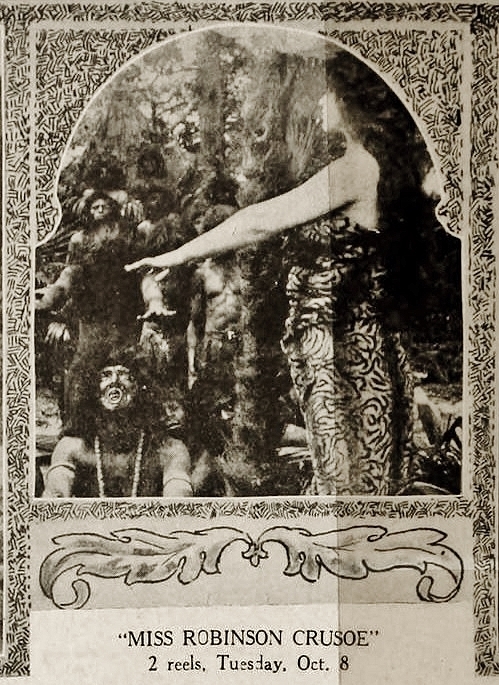 Above, a publicity photo for The Star of Bethlehem, appearing with the review of the film by W. Stephen Bush in The Moving Picture World, December 21, 1912. 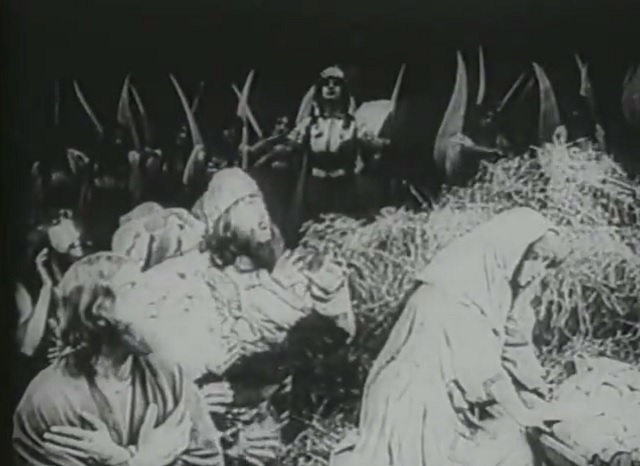 This scene of Mary on the donkey does not appear in the surviving single reel reduction of the film. Below, Thanhouser advertising posters for the British release of The Star of Bethlehem (1912). Above, a large three-sheet poster; below, a 30×40 poster, both printed in England. 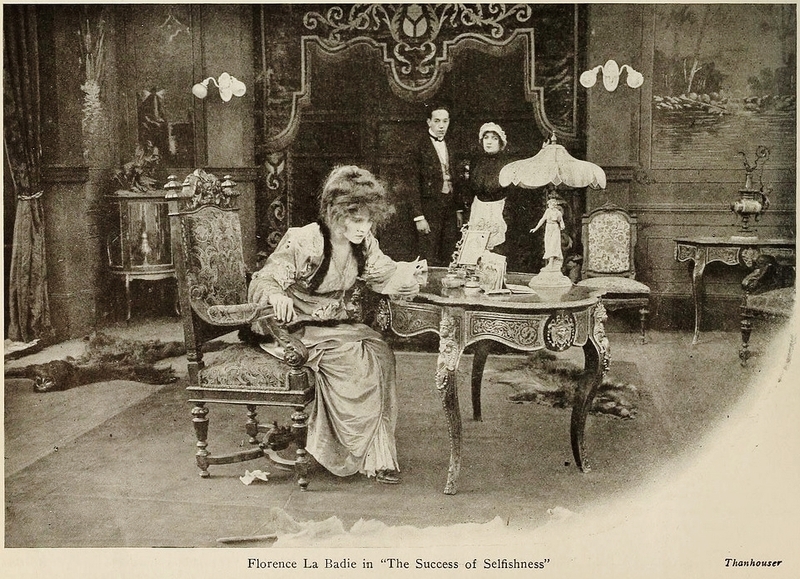 In The Evidence of the Film (co-directed by Lawrence Marston and Edwin Thanhouser), released January 10, 1913, the plot hinged upon a relatively novel device, the “film within a film.” Florence La Badie played a woman, a film cutter, whose brother (played by “Thanhouser Kid” Marie Eline) is a messenger boy entrusted to deliver an envelope of bonds from a broker to a client. The broker (William Garwood) has been threatened with a lawsuit if he fails to return $20,000 in bonds by a deadline. However, he has a scheme to avoid payment. The broker secretly creates a “dummy” envelope filled with newspaper, then with his employees as witnesses, places the real bonds in an identical envelope which he hands them to have sent via messenger. The broker follows the messenger boy on his delivery route. The boy stops briefly to observe a film crew in action. The broker trips the boy, who drops the envelope. The broker substitutes the dummy envelope. When the boy makes the delivery, the client finds no bonds, has the boy arrested and, along with the broker, brought before a magistrate. The sister receives a call from her brother explaining his plight, and she goes to the magistrate to plead his innocence, but to no avail. Distraught, she returns to work at the film lab where she discovers that the encounter between her brother and the broker has been caught on film, evidence of his innocence. She takes the film to the magistrate, and after the film is viewed on screen the broker is arrested. The sister sees her brother off to work, and later at the film lab she is informed that she has a phone call . . .
. . . from her brother (Marie Eline) explaining that he has been accused of theft of the bonds by the broker, and that he has been arrested. The sister pleads his innocence before the magistrate and the broker (William Garwood), but to no avail . . .
. . . later, back in the film lab, she finds proof of his innocence on film. 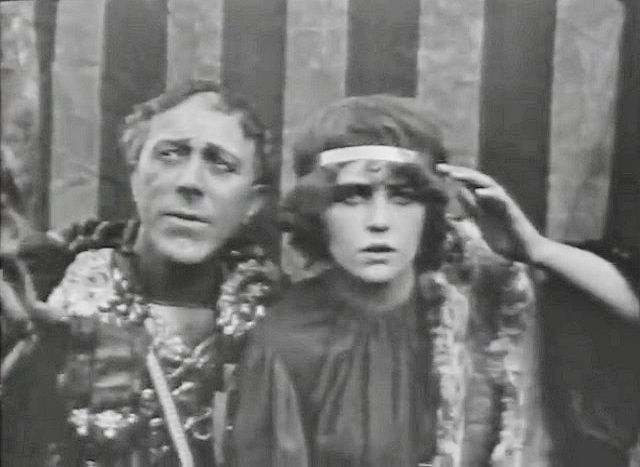 Florence La Badie’s next major role came in Thanhouser’s adaptation of Shakespeare’s tragedy, Cymbeline (dir. Lucius J. Henderson), a tale of forbidden marriage, jealousy and attempted murder in ancient Britain. 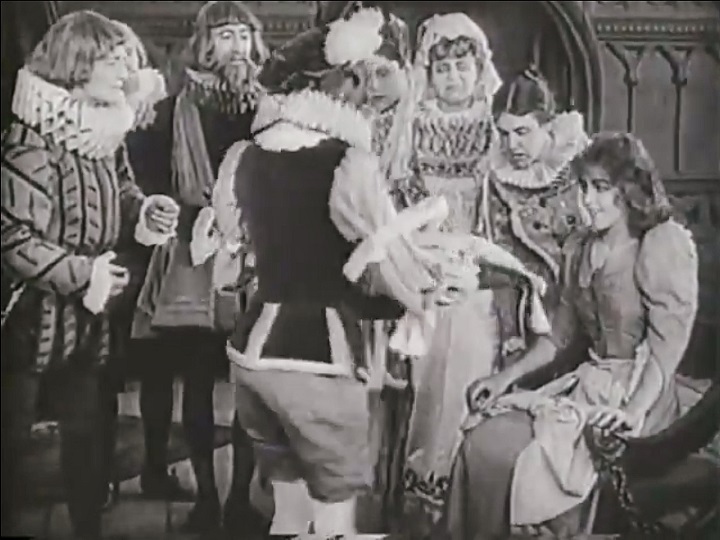 In the two reel production released March 28 and shot in Southern California at the Mutual studio rented by Thanhouser, La Badie played the pivotal role of Imogen, daughter of King Cymbeline, and the film version focuses on her wanderings after she marries without the King’s approval. 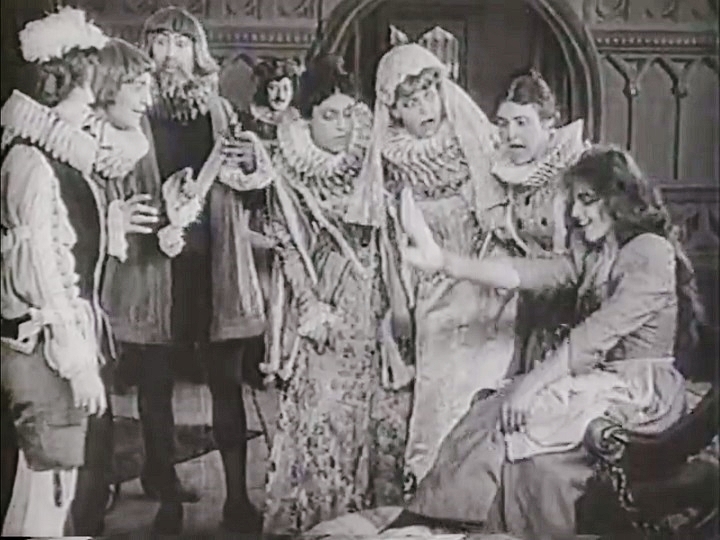 Imogen (Florence La Badie, center) has had her marriage to Leonatus (James Cruze) annulled by the King; Leonatus is banished, but a rival, Iachimo (William Garwood) plots to prove her infidelity by stealing her bracelet as she sleeps. The bracelet is gone, and after Iachimo tells Leonatus that his wife has been unfaithful — using her bracelet as proof — Leonatus sends an emissary with a message for Imogen to join him. In reality the emissary has orders to kill her, but after giving her the message, he cannot commit the murder. Imogen wanders the countryside disguised as a boy; she is captured during the Roman invasion and becomes a page to the Roman general; during the battle, the Romans are defeated by the British, led by King Cymbeline and joined by Leonatus. The Marble Heart, a two reel drama released May 13, starred James Cruze as a young sculptor and Marguerite Snow as a model with whom he becomes obsessed. Florence La Badie, however, was impressive in the supporting role of Marie, a homeless girl taken in by the sculptor’s mother who sees the girl as a potential wife for her son. Marie falls in love with the young man, but he regards her only with brotherly affection and loves instead a model who has a heart of stone. Unfortunately, the film drops what could have been a touching romantic triangle and, in the second reel, devolves into a fantasy in which the sculptor’s obsession with his model and her marble likeness takes him to (yes) ancient Rome. He awakens and smashes the statue, which ends both his obsession and his life. 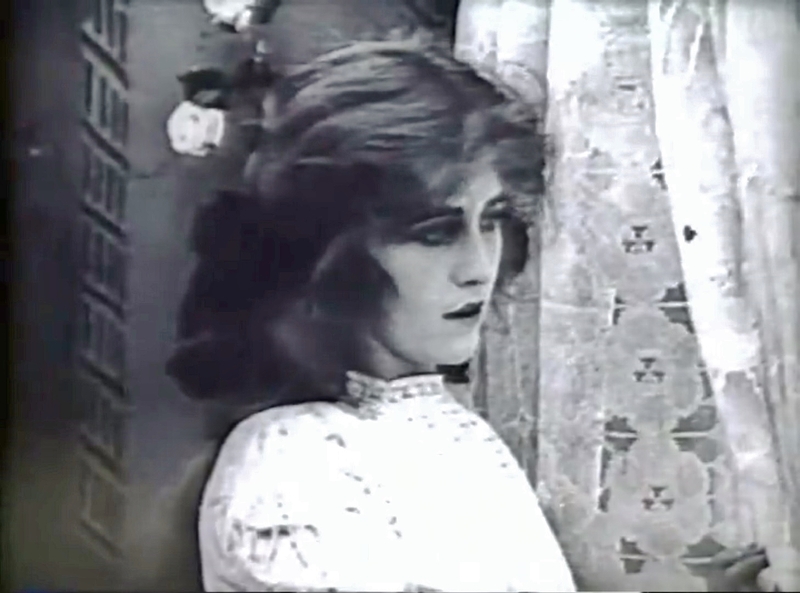 Marie (Florence La Badie) is a homeless girl taken in by an elderly woman . . . She sees her as a potential wife for her son, the sculptor (James Cruze), but he regards her only with a brotherly love. Marie watches as the young man leaves, and prays for his return — in vain. (The Marble Heart, released May 13, 1913). 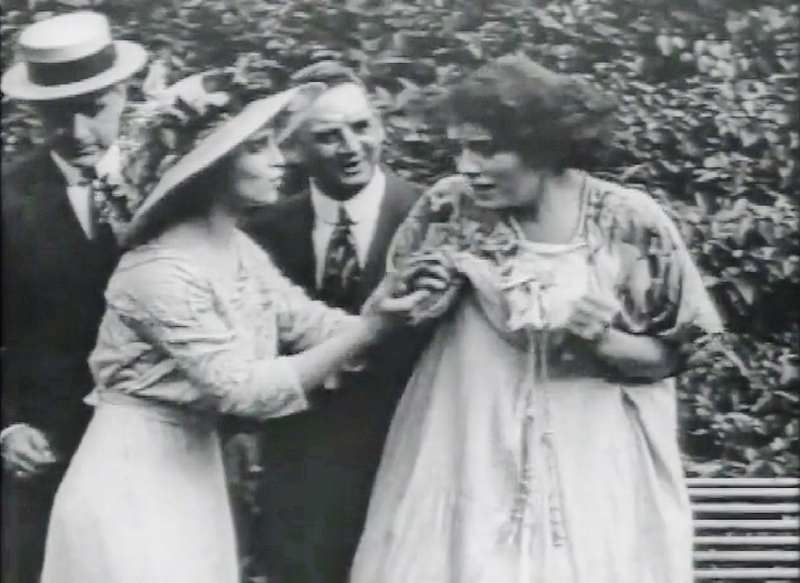 In The Snare of Fate, a 2 reel drama released June 17, 1913, La Badie plays a young woman forced to borrow money from a usurer (James Cruze) when her life’s savings are depleted due to the illness of her mother. When her expenses become too great, she seeks additional funds from the usurer who agrees only on the condition that she becomes his wife. Their marriage is miserable — she leaves him after seeing his treatment of others, taking their infant child with her. The usurer is stricken with paralysis near tenements he owned, and cannot speak. He is taken in by people whose eviction he has ordered who do not recognize him. In a twist of fate, he is evicted into the street along with his tenants, who take him to a hospital. The same evicted tenants are helped by the usurer’s wife, and they tell her of the anonymous stricken man. She goes to the hospital to investigate and discovers her husband, who soon dies. He leaves her his fortune which she will use to aid the less fortunate. Tannhäuser (dir. 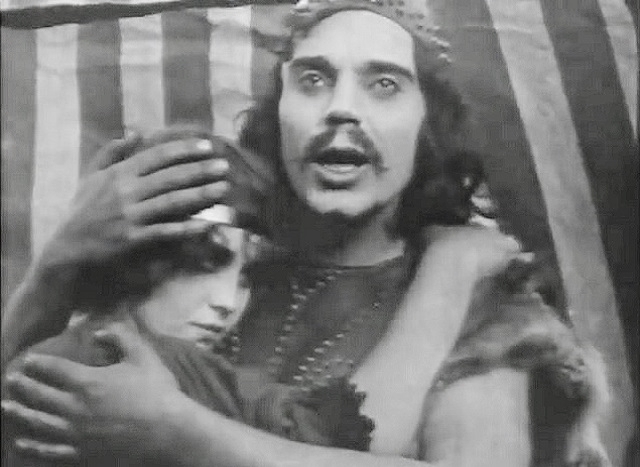 Lucius J. Henderson), shot in California and released July 15, 1913, was a three reel adaptation of Richard Wagner’s opera, itself based upon medieval German myth. A princess (Marguerite Snow) falls in love with Tannhäuser, a minstrel knight (James Cruze), though she is engaged to a nobleman (William Russell). The knight is tempted and seduced by Venus (Florence La Badie) — who in this tale is a mountain spirit with a retinue of wood nymphs. Aside from the Venus sequences, the film is primarily a series of static tableaux. La Badie’s Venus dominates every scene in which she appears — she is both an idealized beauty and intoxicating temptress. Tannhäuser must pray very hard indeed to be released from her spell, yet ultimately it destroys him. Above, Venus (Florence La Badie) and her wood nymphs. 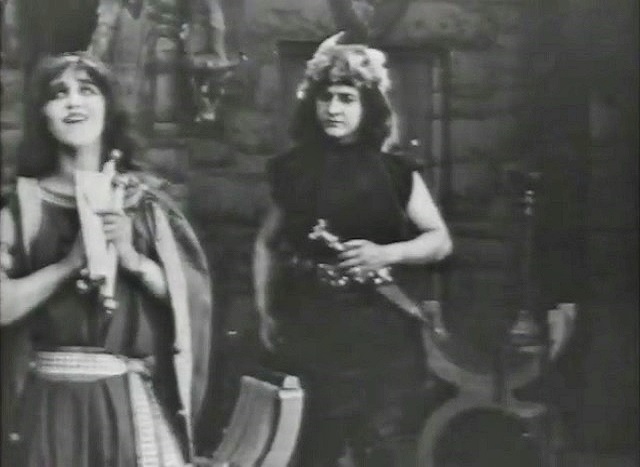 Below, Venus tempts Tannhäuser to follow her into the mountain. Tannhäuser is captured by her charms; he later enters a Catholic order and prays for release from temptation. To be sure, the on-screen accidents had continued unabated, as The New York Clipper, an entertainment industry trade paper, noted in midsummer, 1913. “‘The Accident Kid’ is what they now call Flo La Badie at Thanhouser studio. The other week a railing of the Mutual booth at the moving picture exposition, fell on her knee, and just the other day the horse she was riding in ‘The Ward of the King,’ an historical play, reared and brought his head up in crashing contact with Miss La Badie’s face. 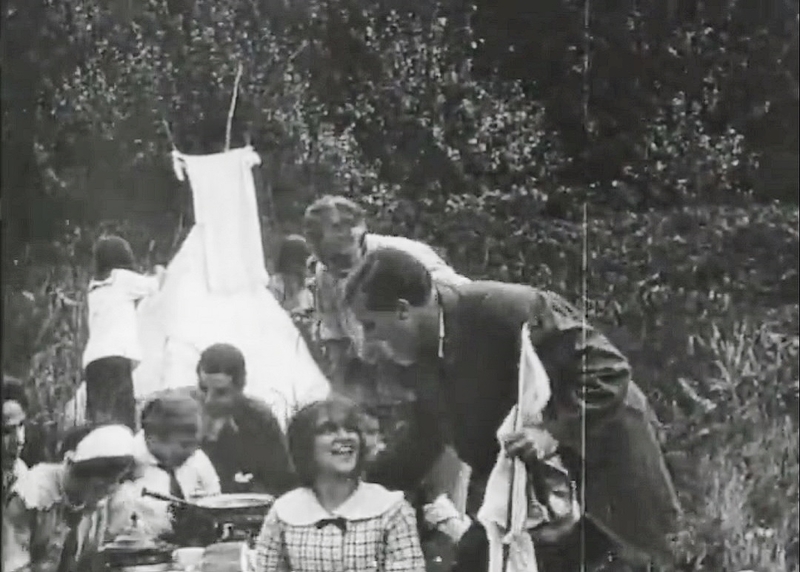 Then the girl tumbled from the horse, and Director Eugene Moore, rushing up, thought she was severely injured. But Miss La Badie hadn’t even fainted, and except for a swelling on the left side of her face, bore not a single mark of the accident. It was like that other ‘lucky mishap’ of Miss La Badie’s, in ‘Undine,’ last Fall, when diving in a water scene, she ‘struck bottom’ on her mouth, and merely broke a few teeth! 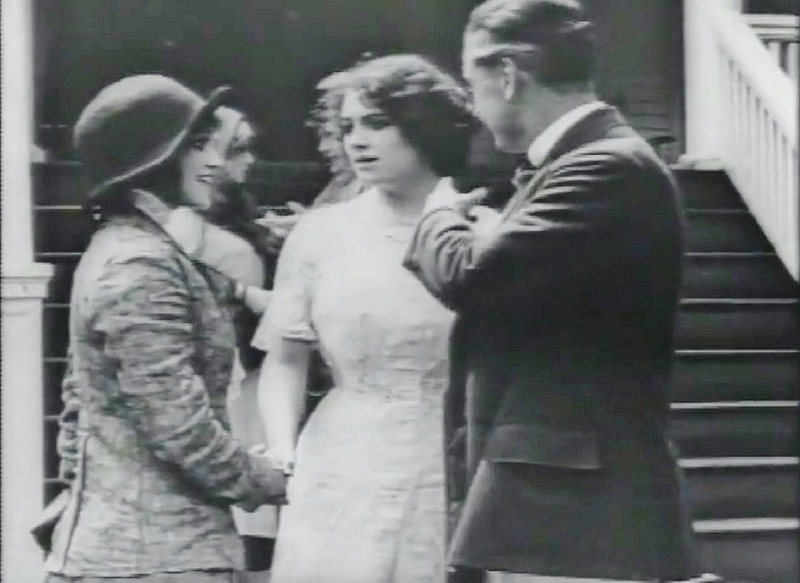 Life’s Pathway, a 2 reel drama released September 30, featured the “Thanhouser Twins,” Madeline and Marion Fairbanks, as orphaned twin sisters adopted by separate families, one of which becomes wealthy, the other of modest means. Florence La Badie plays both sisters as young women, one spoiled who marries a stockbroker, the other humble who devotes her life to charitable work. The stockbroker goes bust, leaving his now penniless and ill wife who winds up at the homeless shelter run by her sister. Florence La Badie as the spoiled sister in a publicity still from Life’s Pathway, Reel Life magazine, September 27, 1913. Reel Life was a publication of the Mutual Film Corporation, a film distributor for a dozen independent producing firms including Thanhouser. 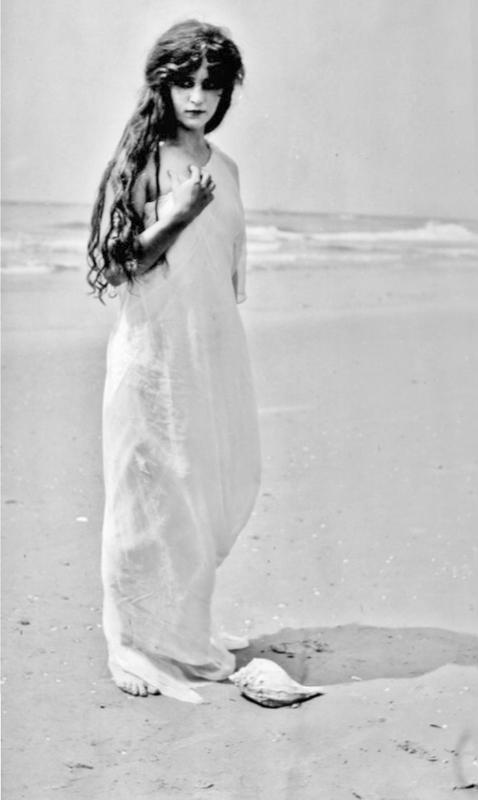 Florence La Badie is the “Beauty” in Beauty in the Seashell, a “Cape May Thanhouser” film released October 19, 1913. In August 1913, a Thanhouser contingent, including Florence La Badie, spent the month at the seaside resort of Cape May, New Jersey, shooting a half dozen films. La Badie appeared in several. In Beauty in the Seashell (dir. Carl L. Gregory), a fantasy released October 19, she played the “Beauty,” a cross between a mermaid and a genie, locked inside a seashell. The Mystery of the Haunted Hotel (dir. 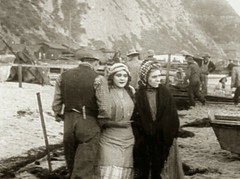 Carl L. Gregory), released October 21, was the second film La Badie shot at Cape May. The mystery concerns a seaside hotel supposedly haunted by the ghost of the proprietor’s (William Russell) wife, causing tourists to shun the spot (today that would be an attraction!). A visiting doctor (Harry Benham) is determined to investigate. He discovers that the proprietor’s daughter (La Badie), unhinged by her mother’s death, is the “ghost” haunting the premises. He treats and “cures” the daughter, and the hotel’s reputation is restored. In The Water Cure, a Cape May comedy released November 2, La Badie plays a pretty mid-western girl visiting her aunt at the seashore. She attracts many admirers, and after she tells them how much she loves the ocean, several take her out in various vessels, but each time with same result — she is dumped into the sea. 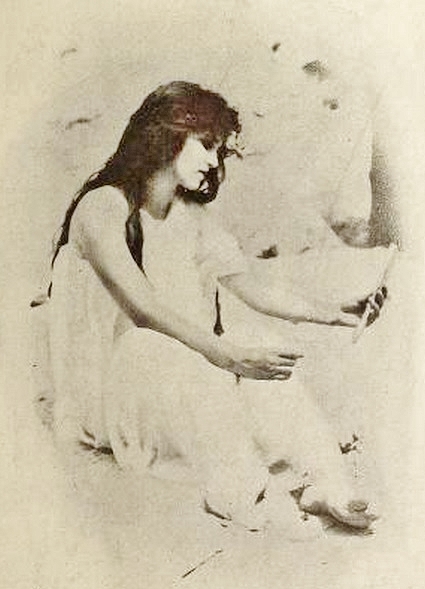 Florence La Badie in The Water Cure, photo from Reel Life magazine, November 1, 1913. Curfew Shall Not Ring Tonight, released November 28, 1913, a period drama based upon a 19th century poem, tells the improbable 17th century tale of a young cavalier (William Russell), a follower of King Charles, who is condemned to hang by Oliver Cromwell (Arthur Bauer), the execution set to occur at the toll of the evening curfew bell. His sweetheart (Florence La Badie) climbs to the top of the bell tower and by grabbing and holding on to the striker prevents the bell from ringing. Cromwell, impressed by the girl’s devotion, frees the cavalier. 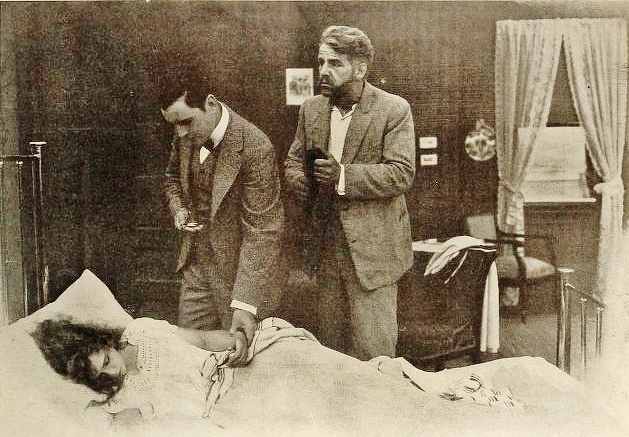 Above, Arthur Bauer, William Russell and Florence La Badie in Curfew Shall Not Ring Tonight (1913), publicity still from Reel Life magazine, November 22, 1913. 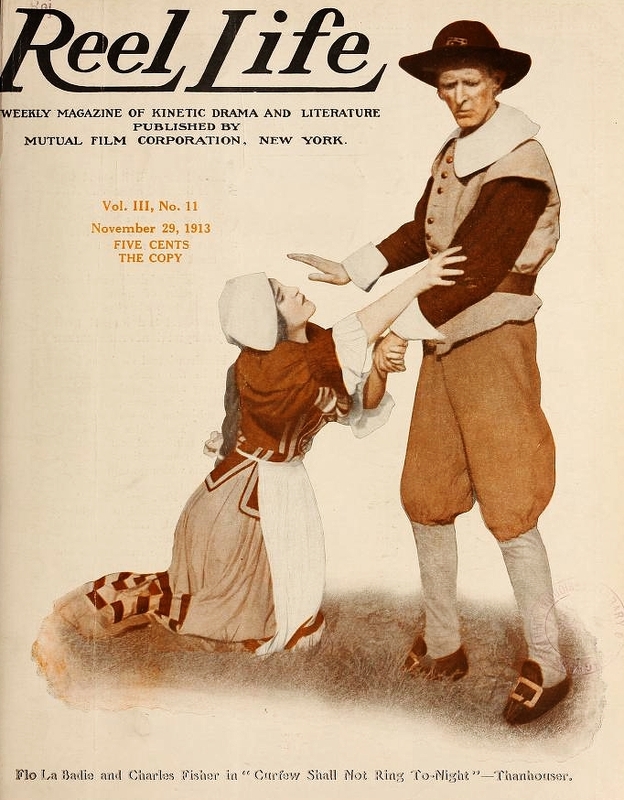 Below, Florence La Badie and Charles Fisher, cover of Reel Life, November 29, 1913. The Head Waiter, released December 28, 1913, was a comedy of errors in which a head waiter (Arthur Bauer) who is being sized up by a young society woman (Florence La Badie) as a candidate for her vacant butler position mistakenly assumes that her invitation for him to call at her estate is a sign that she is smitten with him. When the dust settles, he becomes her invaluable new butler. Arthur Bauer and Florence La Badie in The Head Waiter (1913), publicity photo in Reel Life, Dec 27 1913. 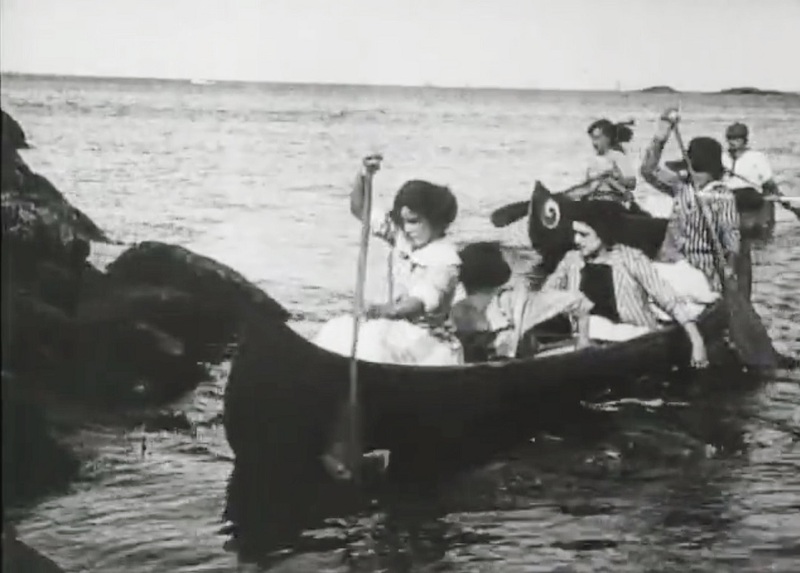 In Adrift in a Great City, released January 13, 1914, an Irish immigrant (Sidney Bracy) who has become a successful construction foreman in New York sends for his wife and daughter (Florence La Badie) to come to America. On his way to meet them at the docks, he is severely injured in an accident and is hospitalized unconscious for a lengthy period. 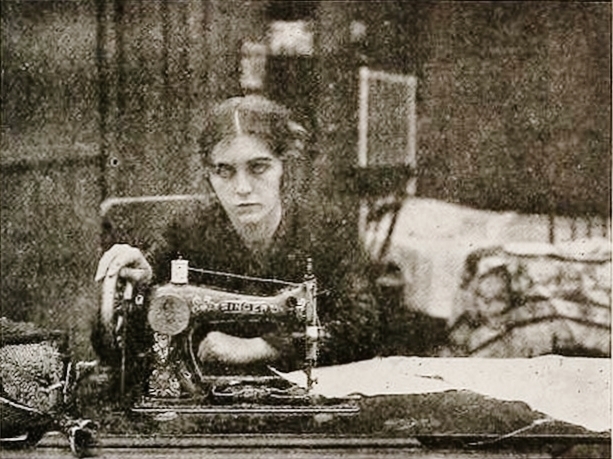 Alone and adrift in the big city, the women soon run out of funds, but the daughter finds work in a sweat shop where she subsequently loses her eyesight. 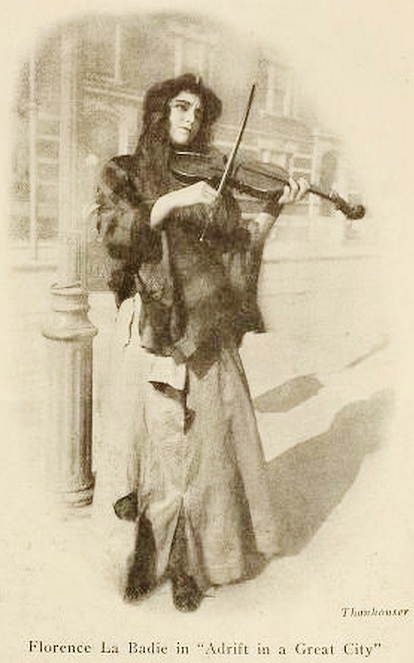 She is reduced to playing the violin for pennies on the streets. The father eventually recovers and hears the girl playing and recognizes her. 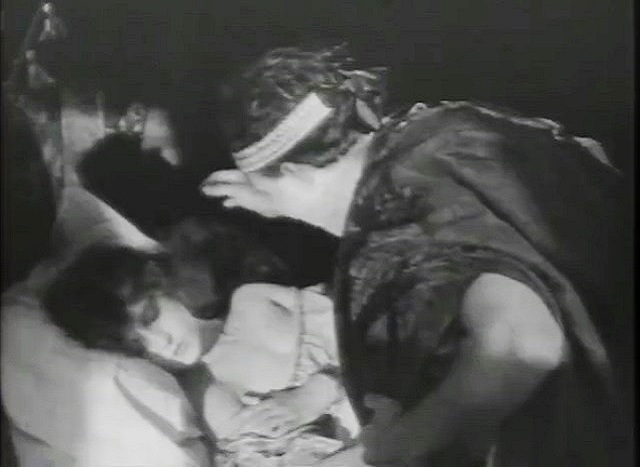 The family is reunited and a doctor (Arthur Bauer) finds the girl’s blindness to be curable. All in one reel (!). The Elevator Man, released January 25, took the old concept of office romance and transferred it to a novel setting. 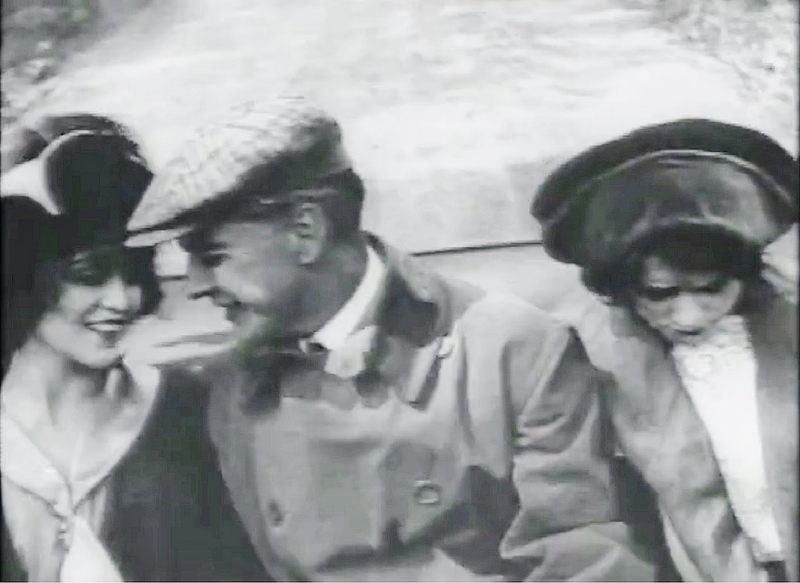 An elderly elevator operator (Riley Chamberlin) plays matchmaker to a couple of young workers, a clerk (Harry Benham) and pretty stenographer (Florence La Badie), who become engaged. When a quarrel and the attention of another man (Sidney Bracy) threatens the relationship of the young couple, the operator intervenes to ensure they reunite for a happy ending. 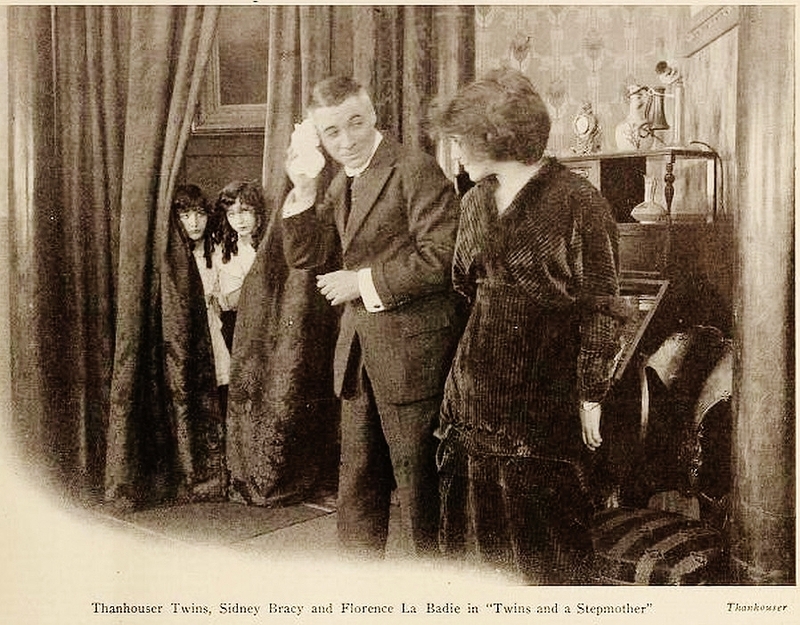 Twins and a Stepmother, released February 3, was another variation on the match-making theme, this time the perpetrators being the “Thanhouser Twins” (Madeline and Marion Fairbanks). The Twins see their beloved Sunday school teacher (Florence La Badie) as being the ideal match for their widower father (Sidney Bracy). Unbeknownst to the girls, their father has already fallen in love with the teacher (who lives conveniently next door). The comedy apparently comes in the way the adults maneuver the girls into thinking that they have actually arranged the match and orchestrated their father’s proposal of marriage. The Success of Selfishness, released February 6, featured La Badie in a drama that seems to anticipate by nearly two decades the manipulative Baby Face (1933) of Barbara Stanwyck. A small town stenographer, Irene (Florence La Badie), uses her charms on men in order to get ahead, and soon after reaching New York becomes the confidential secretary to a high-flying Wall Street operator (Sidney Bracy). When her boss comes under suspicion of criminal activities, he plans to send Irene, who has direct knowledge of his illegal activities, to Canada to avoid being subpoenaed. Irene decides to take advantage of the situation, and instead of fleeing to Canada, blackmails him into marrying her — as his wife she cannot be forced to testify against him. For a time she enjoys the lifestyle afforded by her wealthy husband but her extravagances drain him financially and he abandons her, leaving her broke, alone and miserable. Cardinal Richelieu’s Ward (dir. W. Eugene Moore), released March 1, was a four-reel “Thanhouser Big Production” based upon a 19th century play by the English author Edward Bulwer-Lytton. 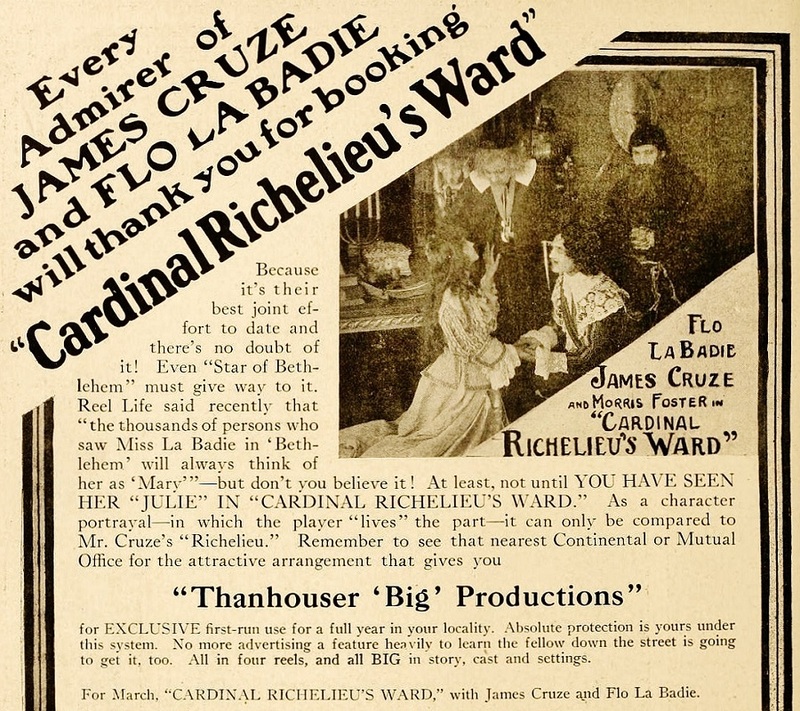 The story of intrigue and conspiracy in the court of French King Louis XIII starred James Cruze as the Cardinal and Florence La Badie as Julie de Mortemar, his ward. 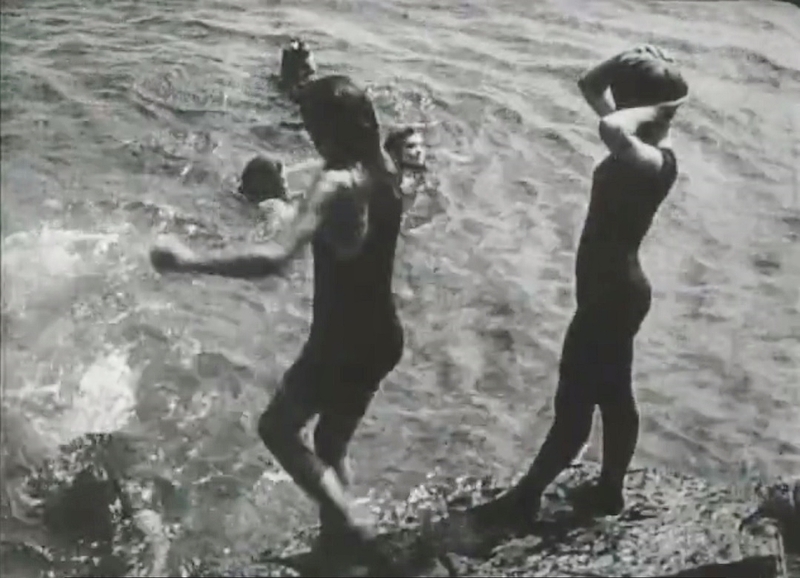 The advertising campaign was one of the first to first to place La Badie’s name prominently at the top of the ad and above the production title. 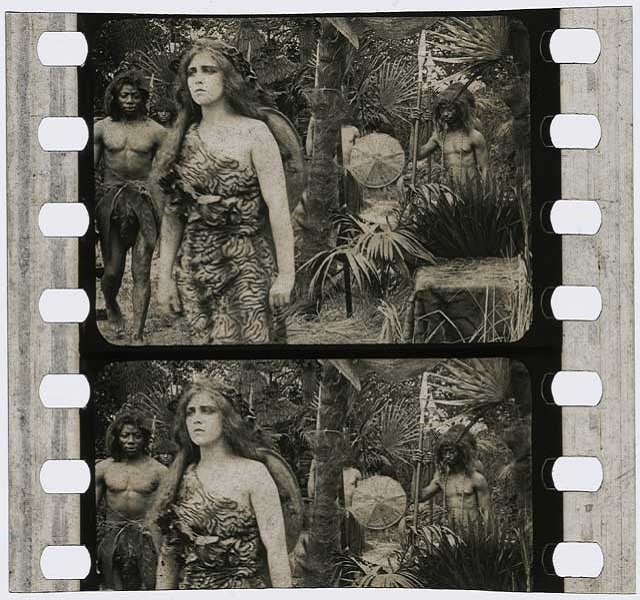 The motion picture serial was a logical development in American cinema of the 1910s. Film distribution was based on the single reel, and exhibitors — many of whom subscribed to the “programs” supplied by distributors — gave audiences two, three or four reels of movies per admission price, still typically five or ten cents in small cities or neighborhood theaters. 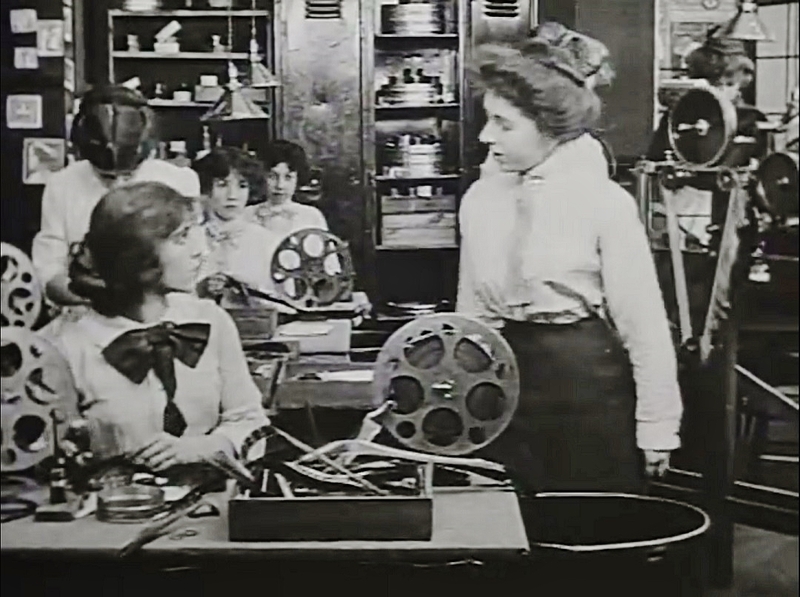 Prior to 1914, multi-reel U. S. feature films based on a unified narrative (such as Thanhouser’s David Copperfield in 1911) were often issued in single reel installments. The serial had its origins in productions such as Biograph’s sporadically released “Mr. 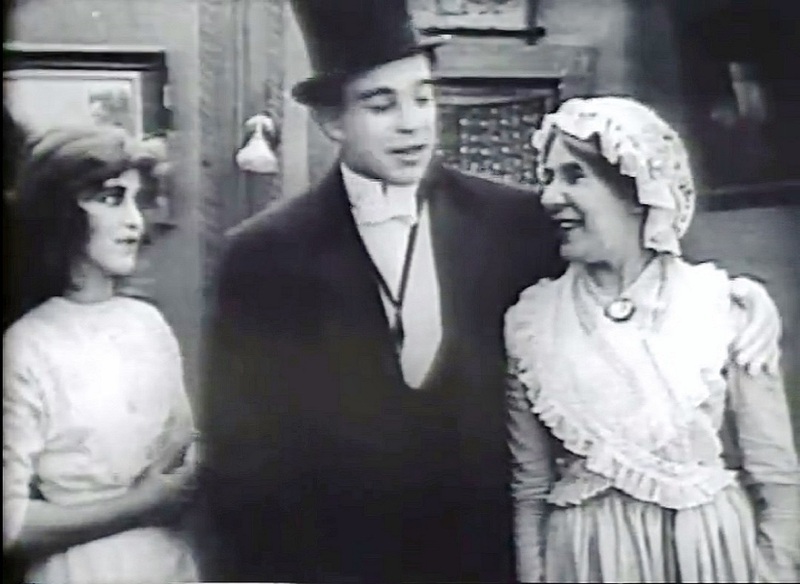 and Mrs. Jones” series (1908-1909), films that had recurring characters much like mid-20th century television sitcoms. 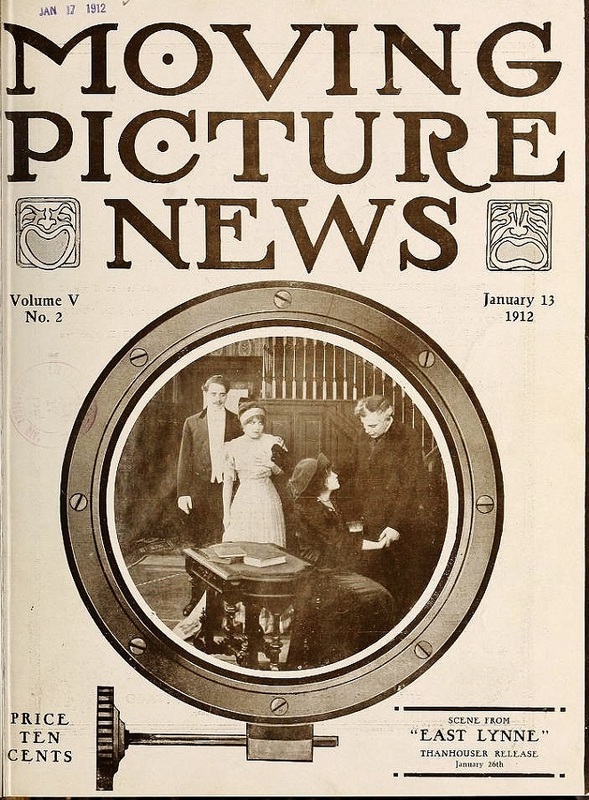 However, it was the linking of film scenarios with serial fiction published in newspaper or magazine form that led to the explosion of the motion picture serial, beginning in July, 1912 with Edison’s What Happened to Mary series starring Mary Fuller and released in tandem with fleshed-out scenarios published in Ladies World magazine. The success of “Mary” spawned serials inspired by if not exactly imitating it: Selig’s The Adventures of Kathlyn (December, 1913) starring Kathlyn Williams, Edison’s second serial foray, Dollie of the Dailies (January, 1914) with Mary Fuller as an intrepid newspaper reporter, and Eclectic/Pathe’s The Perils of Pauline (March, 1914) with Pearl White. 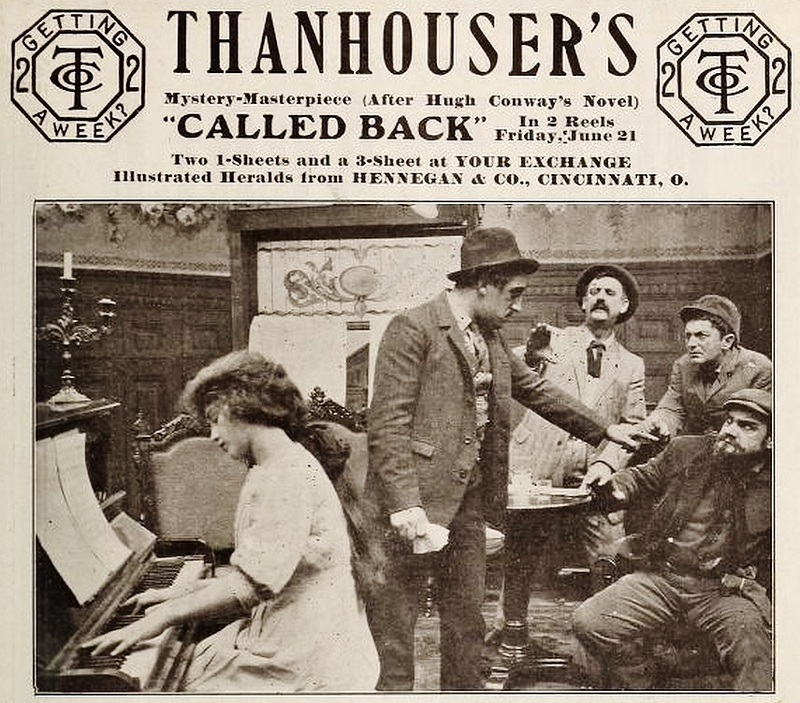 Thanhouser, despite recently announcing its latest attempt at multi-reel features with “Thanhouser ‘Big’ Productions” such as Cardinal Richelieu’s Ward, jumped into the serial wars with a serial billed as an epic production, one with a cast and cost that would rival or exceed that of the six, seven and eight reel features being imported from Europe. 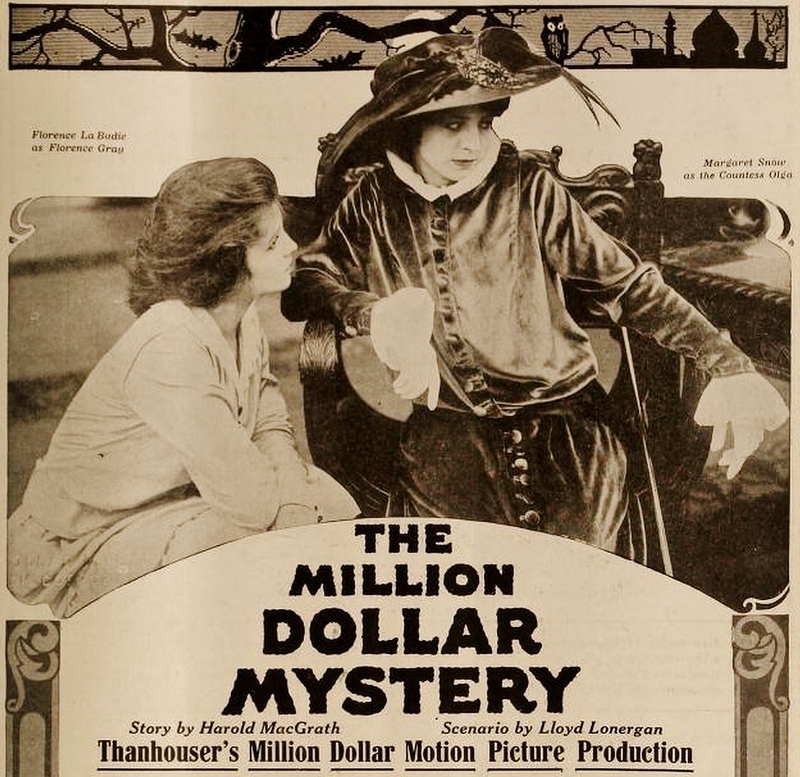 The Million Dollar Mystery, was the brainchild of Thanhouser scenarist and chief publicist Lloyd F. Lonergan, Harold MacGrath (author of The Adventures of Kathlyn) and Thanhouser executive producer Charles J. Hite. It was a serial of twenty-three two reel episodes (twenty directed by Howell Hansel), the first of which was released June 22, 1914, and continued in subsequent two reel installments each Monday through November 16, 1914. The novelized scenarios for each episode were published in newspaper syndication. As an added attraction, the series was promoted with a contest for audiences and readers to submit their solution to the “mystery” prior to the final episode, with the winning entry receiving $10,000. The convoluted plot of “Mystery” introduced audiences to millionaire Stanley Hargreave (Alfred Norton), a former member of a shadowy group of Russian revolutionaries, who fled to America. Complications multiplied when Hargreave’s daughter (Florence La Badie), raised in a convent school under the name Florence Gray, was summoned by her father to join him in America. The Russians, led by a man named Braine (Frank Farrington) and the equally mysterious Countess Olga (Marguerite Snow), are determined to find Hargreave and his daughter in order to get a safe containing a million dollars. Newspaper reporter Jim Norton (James Cruze) served as the hero/detective, and love interest for Florence. Each installment was intended to be self-contained, yet with enough suspense to sustain the story arc to the next episode. 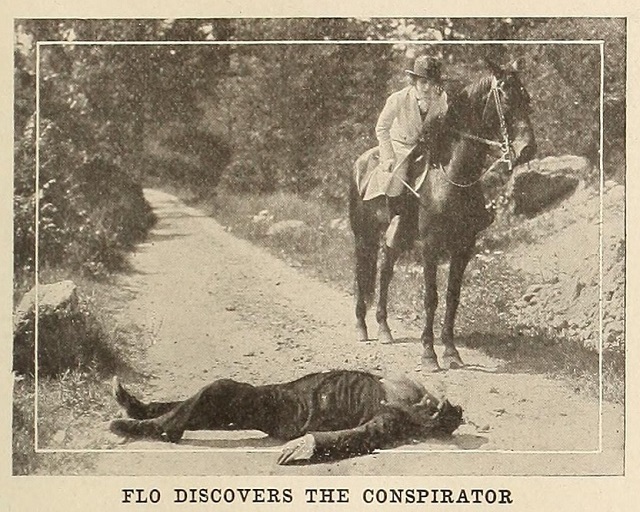 Above and below, Florence La Badie as “Florence Gray” in The Million Dollar Mystery, publicity stills in Motography and The Motion Picture News, August-October, 1914. 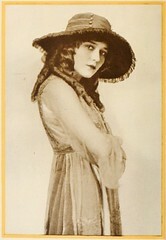 It was her work in The Million Dollar Mystery that cemented Florence La Badie’s reputation as “the actress unafraid,” as noted in the industry trade publications of the period. “Florence La Badie, the heroine of ‘The Million Dollar Mystery,’ has added a new deed of daring to her already long list. Miss La Badie leaped into the water last week from the deck of the ‘George Washington,’ as that leviathan of the deep steamed past Sandy Hook. “FLORENCE LA BADIE, the charming heroine of Thanhouser’s ‘The Million Dollar Mystery,’ demonstrates, in the ninth episode of that series which was released August 11, that she is not only a finished actress but also one of the most daring young women appearing before the camera, when she leaps from the deck of an ocean liner into the sea. “FLORENCE LA BADIE, the pretty and daring heroine of ‘The Million Dollar Mystery,’ illustrates the latter appellation in this episode of the exciting serial to such a vivid extent that it will be impossible to suppress the little ‘ohs’ and ‘ahs’ that have been so often aroused by this exciting serial. “But however thrilling the other episodes have been, this one beats them all. The title of these two reels, ‘The Leap from an Ocean Liner,’ tells just what Miss La Badie’s latest contribution to the thrills of the story is; but is not fully explanatory; she doesn’t jump from a port hole a few feet above the water, but from the uppermost deck. 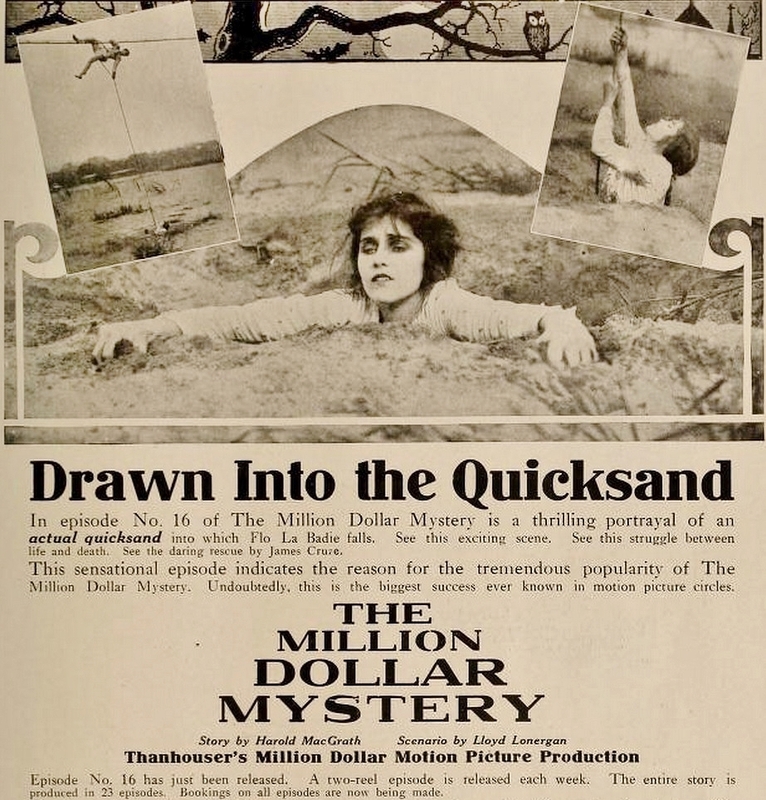 Above, Florence La Badie and Marguerite Snow; below, Florence La Badie in quicksand; Thanhouser ads for The Million Dollar Mystery in Motography, September 12 and October 10, 1914. By the summer of 1914, and with the release of the first episodes of The Million Dollar Mystery, Florence La Badie had become the most popular player at Thanhouser and reached a level of stardom surpassed by little more than a dozen other motion picture actresses. 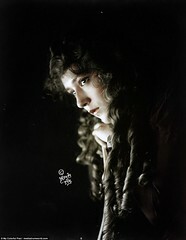 Six years after her stage debut with Chauncey Olcott and three years after leaving Griffith and Biograph, her name could be found in the fan magazine popularity polls near Mary Pickford, Mary Fuller, and the two “other Florences,” Lawrence and Turner — pioneer motion picture players and future legendary figures of early film. 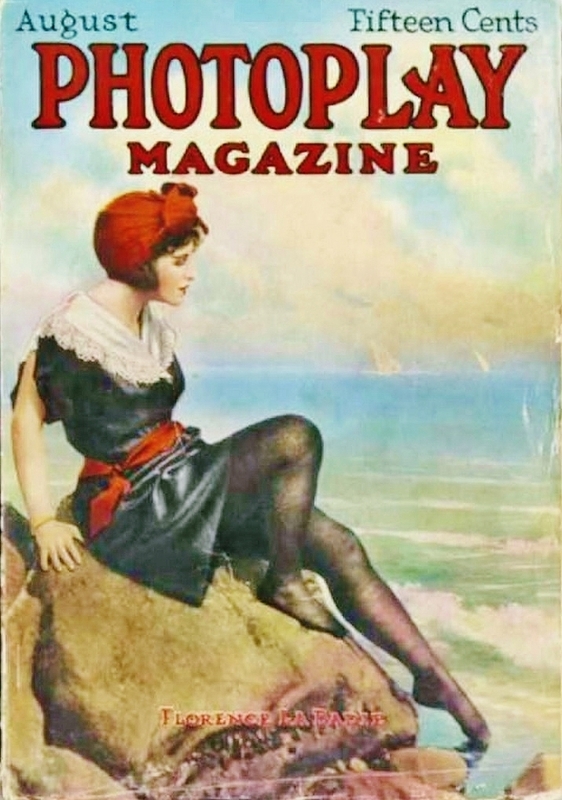 Confirming her new-found status in the industry was her appearance on the cover of the August 1914 issue of Photoplay Magazine. And she was inundated with requests for what would become that most ubiquitous movie fan collectible, the autographed photo. Florence La Badie, cover of Photoplay Magazine, August 1914. Original periodicals: The Moving Picture News, The Moving Picture World, The Motion Picture News, Motion Picture Magazine, Motography and Reel Life, from mediahistoryproject.org ; The New York Dramatic Mirror from fultonhistory.com; Photoplay Magazine, August 1914 cover, from magazines.famousfix.com. 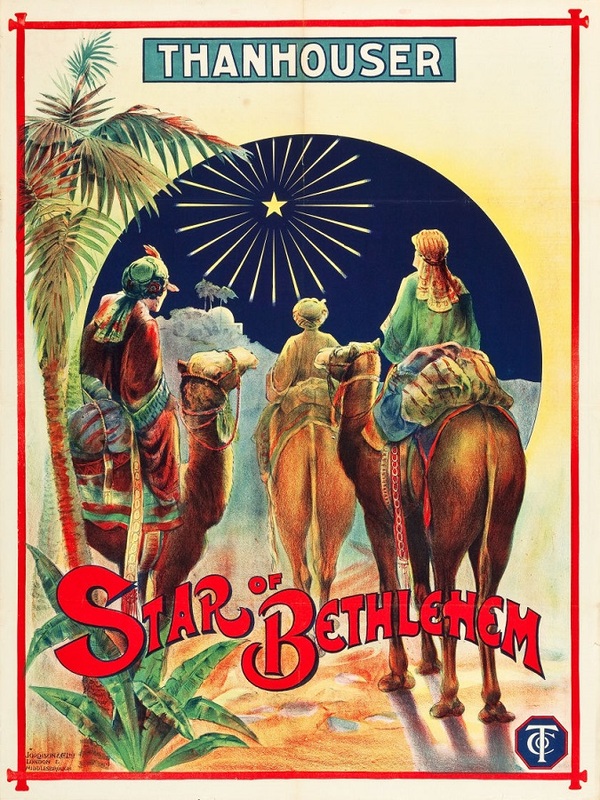 Original British advertising posters for The Star of Bethlehem, 1912, from Heritage Auctions at HA.com. Secondary sources: Bowers, Q. David, Thanhouser Films: An Encyclopedia and History, from Thanhouser.org; Bowser, Eileen, The Transformation of Cinema, 1907-1915 (University of California Press, first paperback printing, 1994). The Films: Still frames of surviving Florence La Badie films from the Thanhouser website at thanhouser.org.